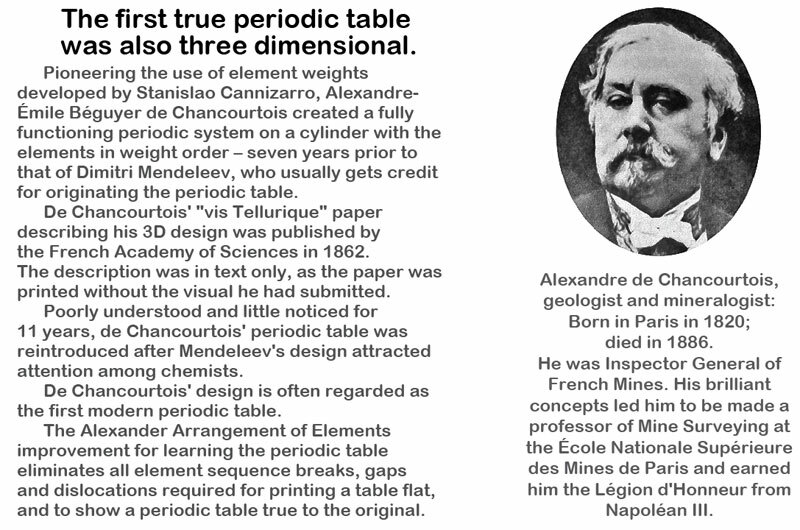 The French geologist , Alexandre-Émile Béguyer de Chancourtois was the first person to make use of atomic weights to produce a classification of periodicity. 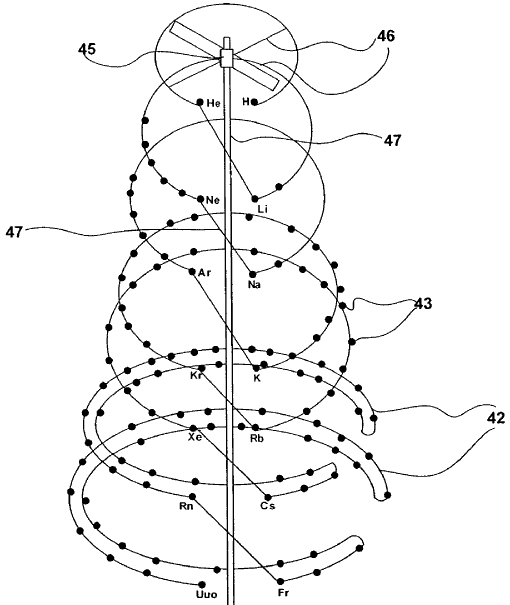 He drew the elements as a continuous spiral around a metal cylinder divided into 16 parts. 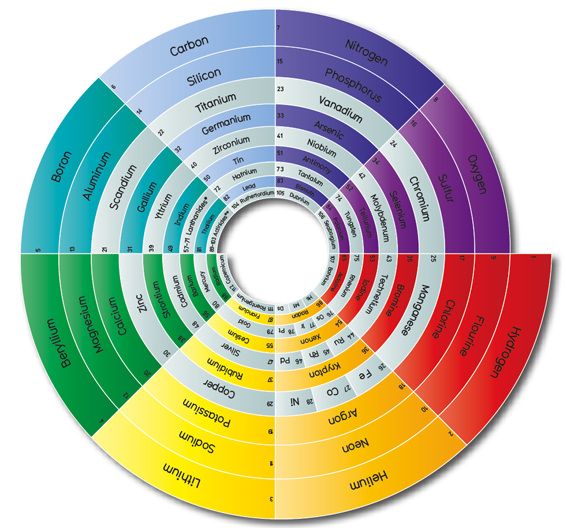 The atomic weight of oxygen was taken as 16 and was used as the standard against which all the other elements were compared. 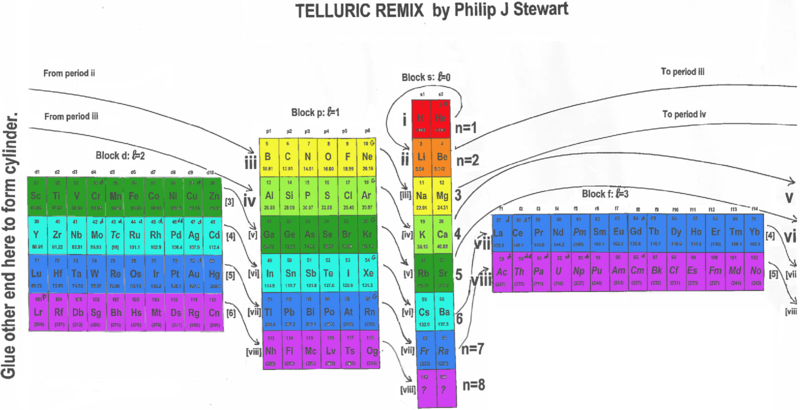 Tellurium was situated at the centre, prompting vis tellurique, or telluric screw. 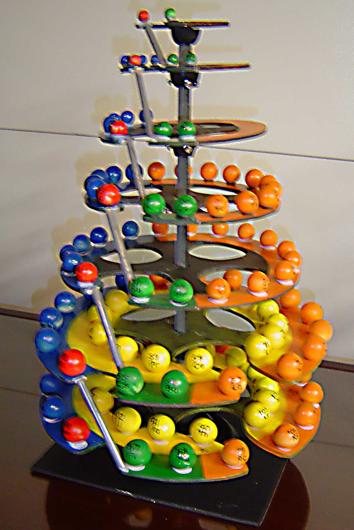 Dutch Wikipedia, ScienceWorld & the Science and Society picture library. 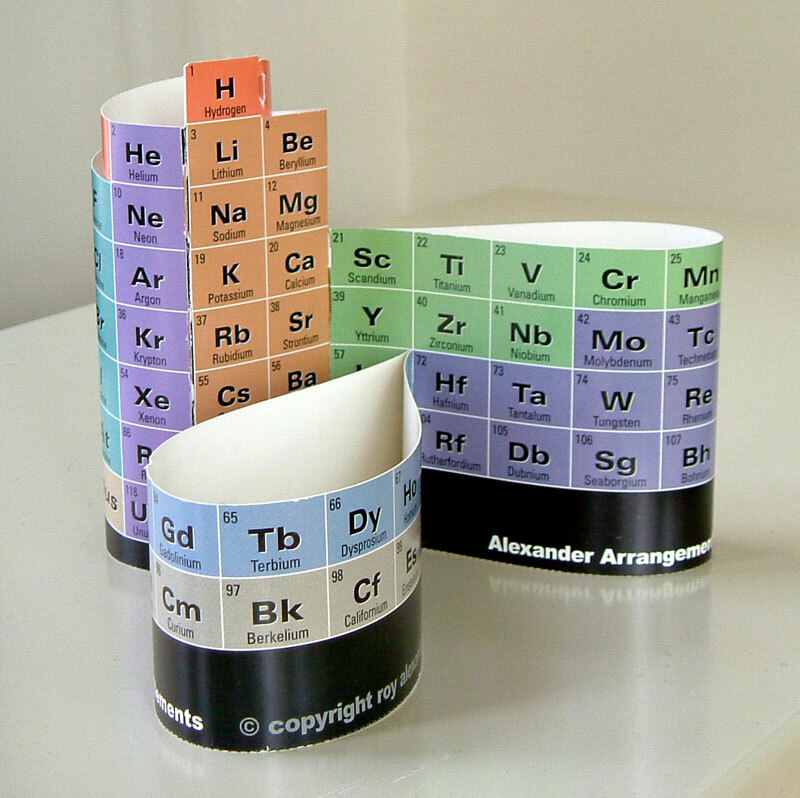 Read more in Roy Alexander's All Periodic Tables site. 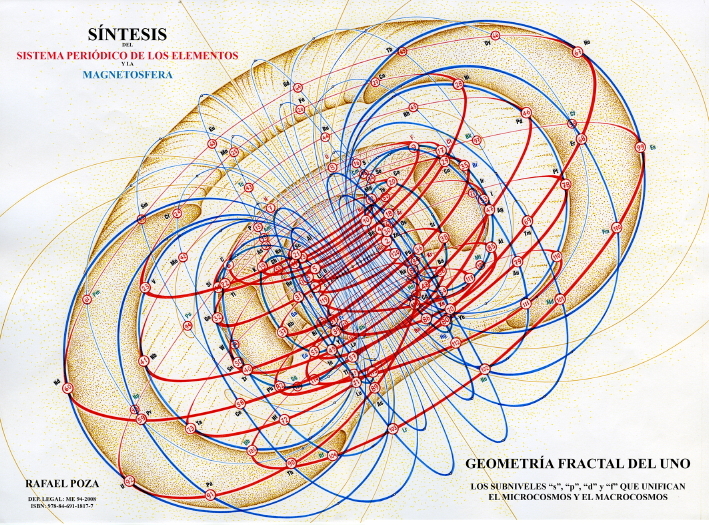 Gustavus Detlef Hinrichs' spiral "Programme of Atomechanics". Programm der Atomechanik oder die Chemie eine Mechanik de Pantome, Augustus Hageboek, Iowa City, IA (1867). 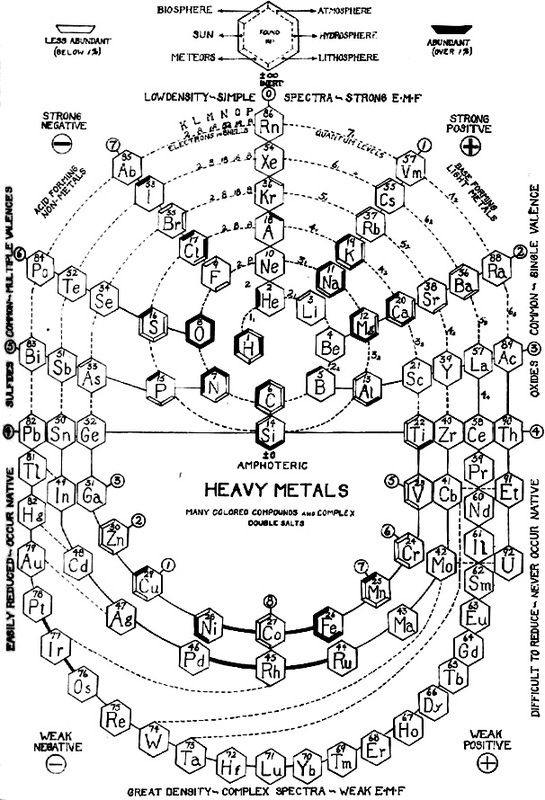 Hinrichs' system is based on the relationship of what he called: "pantogens, with its atoms called panatoms, which explains the numerical relations of atomic weights and gives a simple classification of the elements." 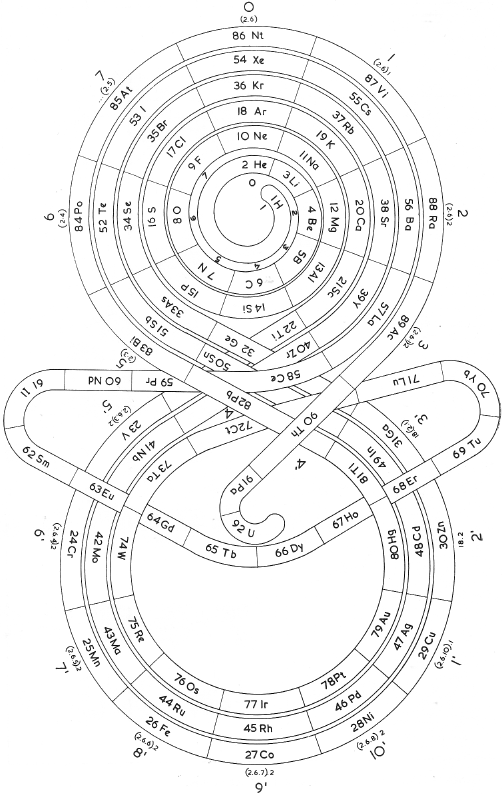 Johnstone Stoney's Spiral, taken from A. E. Garrett's The Periodic Law (page 167, 1909 pub. D. Appleton And Company). The reference is given – page 167 – is: Phil. Mag. 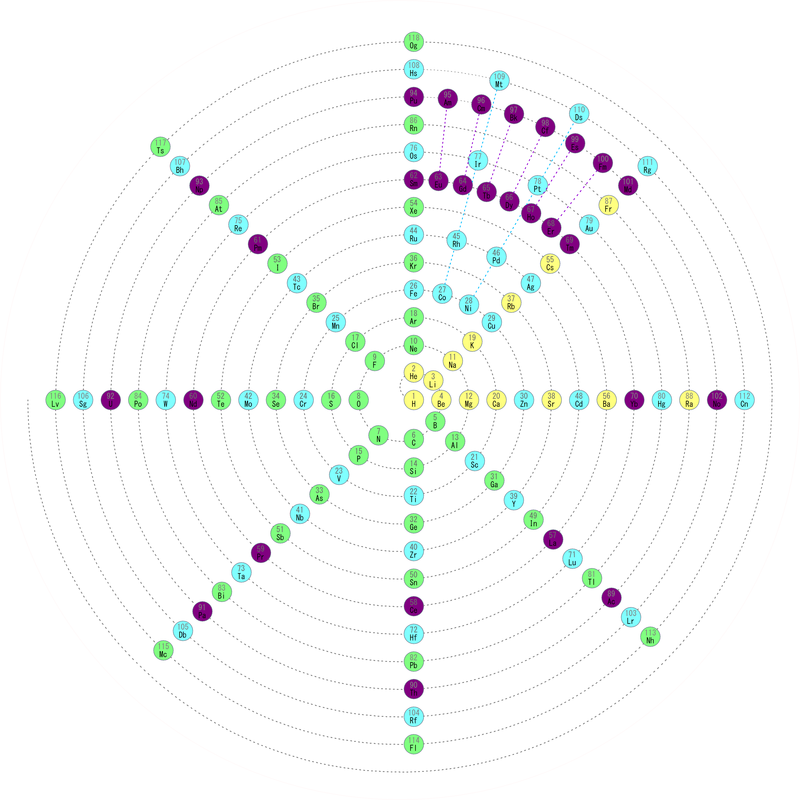 , 4, pp 411 et seq. ; Proc. Roy. Soc., 1888, p115. Thanks to Laurie Palmer for the tip, and to Philip Stewart for the corrections and details. 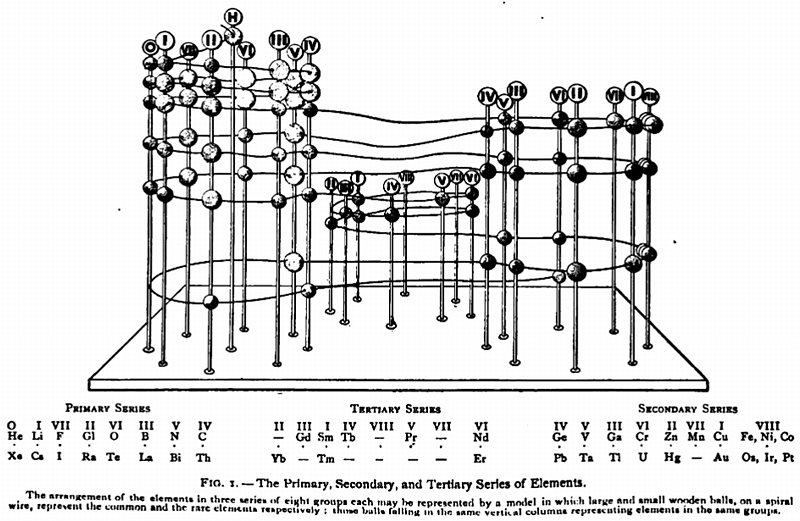 This three dimensional formulation – clearly developed from the Crookes' vis generatrix model – is given a 1905 textbook by Gooch & Walker: Outlines of Inorganic Chemistry (see the Google Books scanned version pp273). 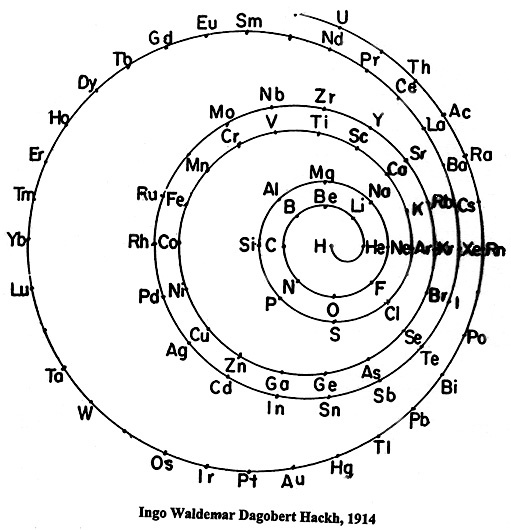 Ingo Hackh's spiral periodic table of 1914, from Das Synthetisches System der Atome, Hamburg, Hephaestos. 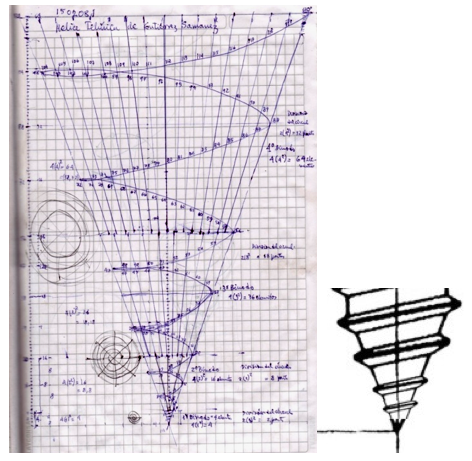 "I believe that Hackh's 1914 spiral is of special interest it is the first spiral to take account of Mosley's atomic numbers, and the first to show successively larger pairs of coils. 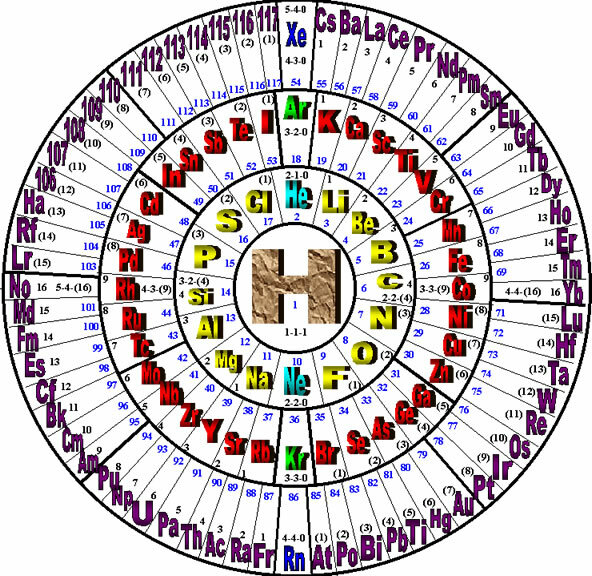 It is also interesting because H stands alone in the centre. 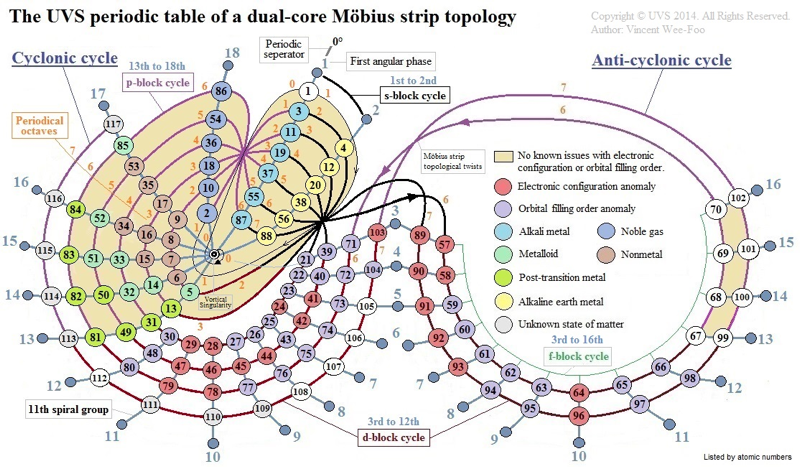 I have only seen Mazurs' redrawn (as usual!) 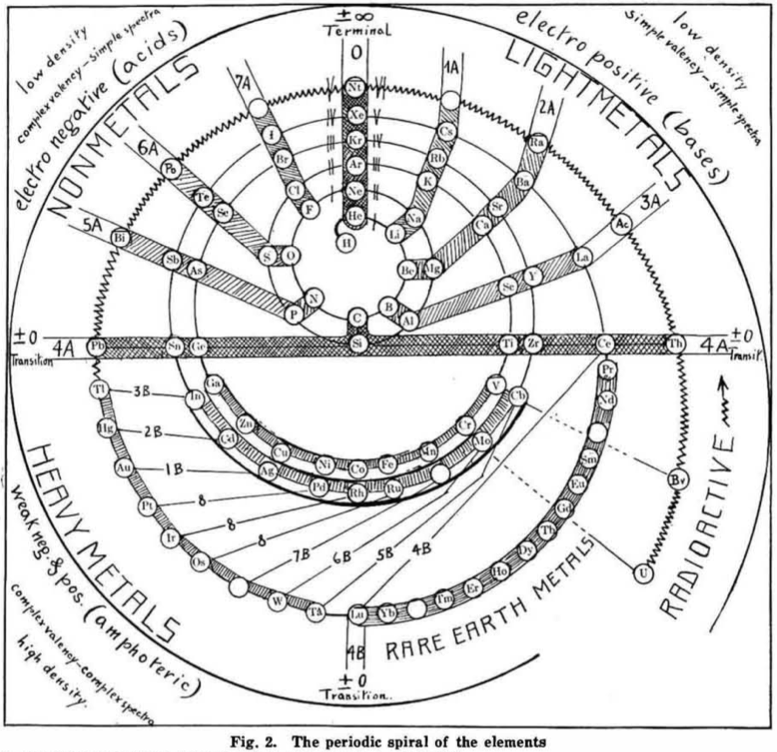 version, but Mazurs gives SciAm Supplement 1919 as one reference." 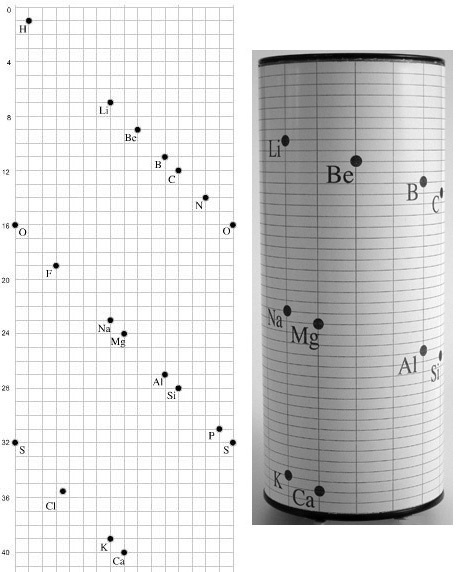 Published in J. Chem. 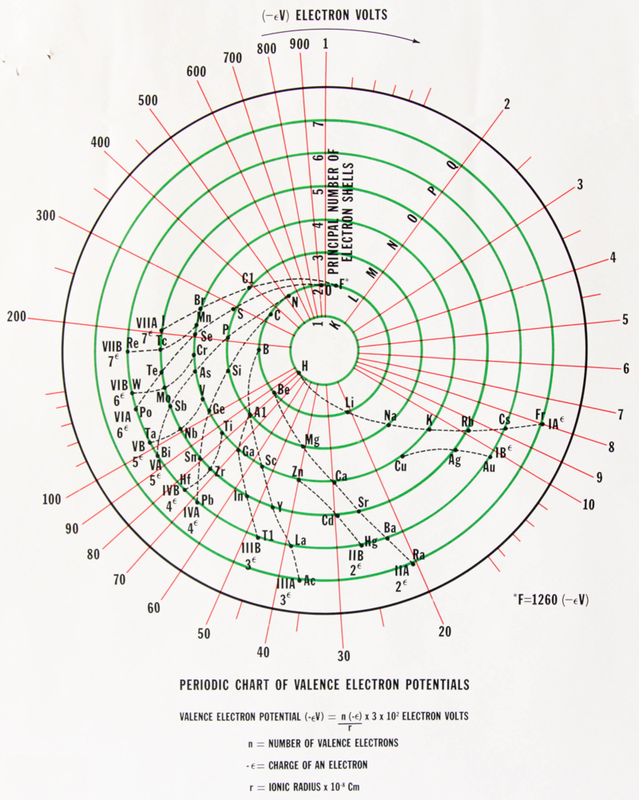 Ed., 2, 2, 107-109 in 1925 by M. Courtines of the Laboratory of Experimental Physics, College of France, Paris. We do not know the date of the forth image (below), but it looks as if it was prepared a few years later. 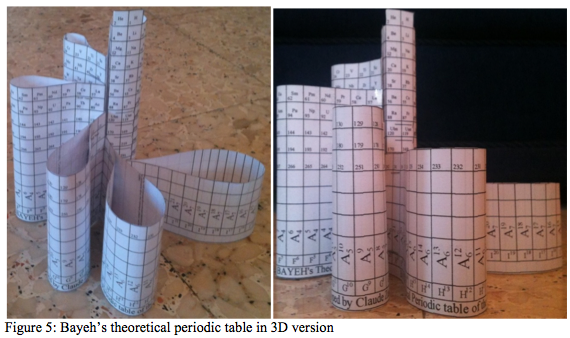 However, it is a 'top down' view of the 3D formulation. 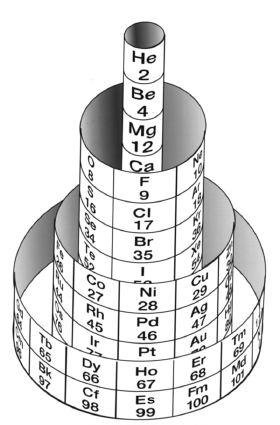 Monroe and Turner's spiral, in which they correctly place the actinides. Information supplied by Philip Stewart. 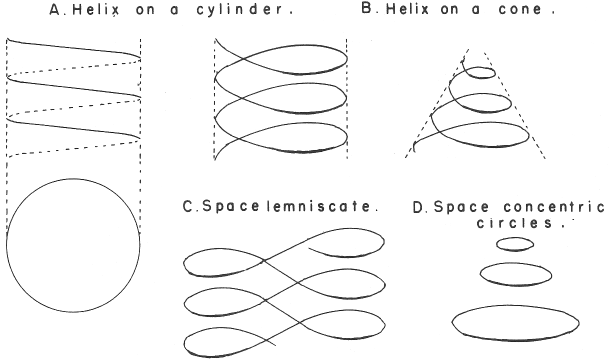 Philip Stewart points out that this formulation is an 'end on' view of the Janet Cylinder or Three-Dimensional Spiral-Tube System formulation, and the term "lemniscate" comes from Mazurs. 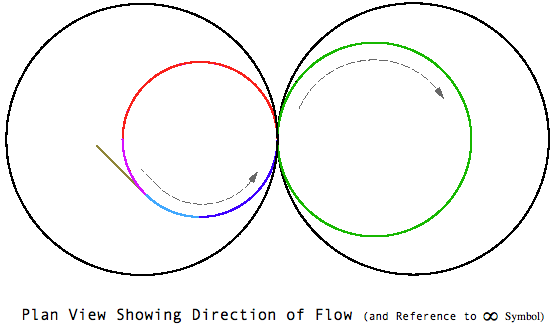 Click here for large diagram. Janet produced six papers, in French, which are almost unobtainable as he had them privately printed and didn't distribute them properly. 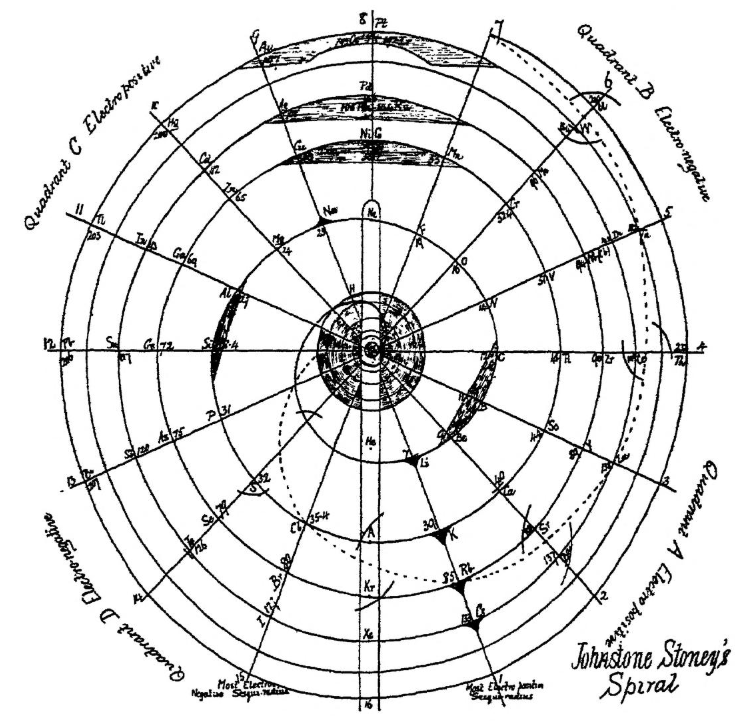 The shell-filling diagram dated from November 1930, six years before Madelung. 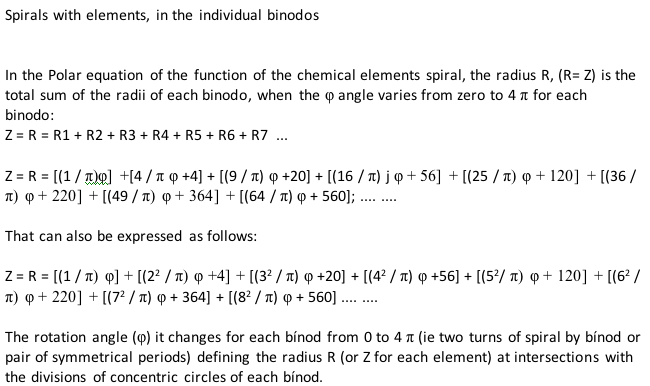 Note that Janet uses Bohr's radial quantum number, k, which is l+1. 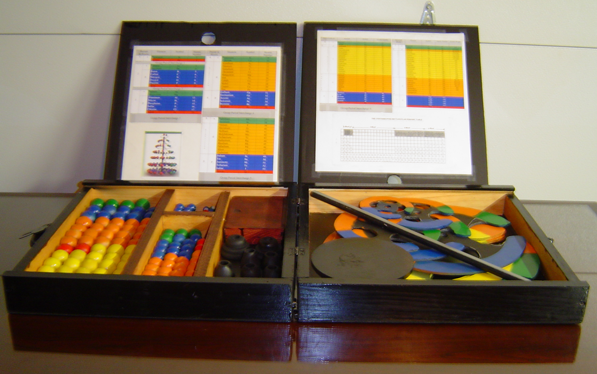 In the text he formulates the n+k-1 rule. Information supplied by Philip Stewart. 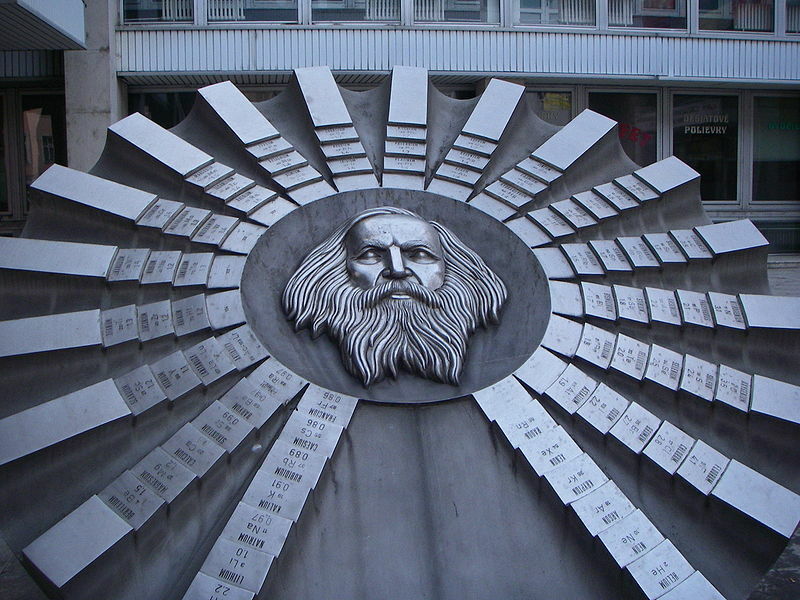 "Mendeleev's Table, like that of Werner and others, are not, however, more than flat projections of the actual ordering of the elements. 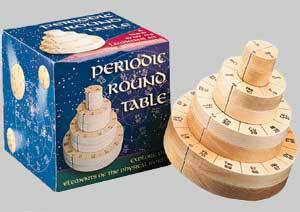 There is as much difference between Mendeleev's Table and the real group as there is between the planisphere and a rotating globe. 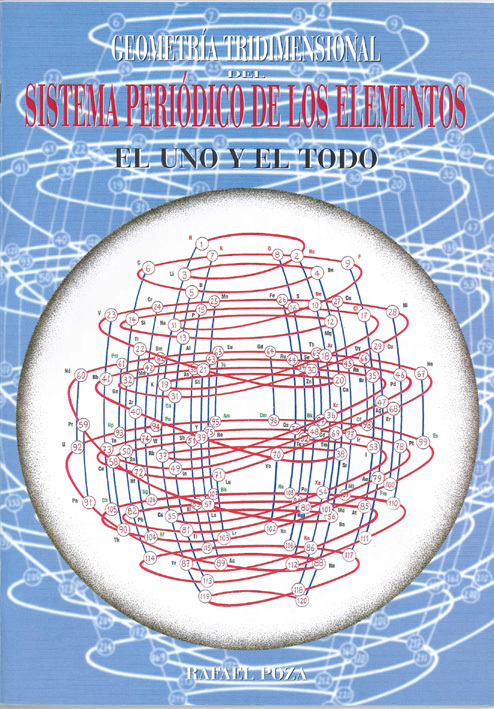 A rational representation, starting from the simplest element – the negative electron –, would be a spiral line that, surrounding said central point, first gave a small turn, touching only two bodies: hydrogen and helium. 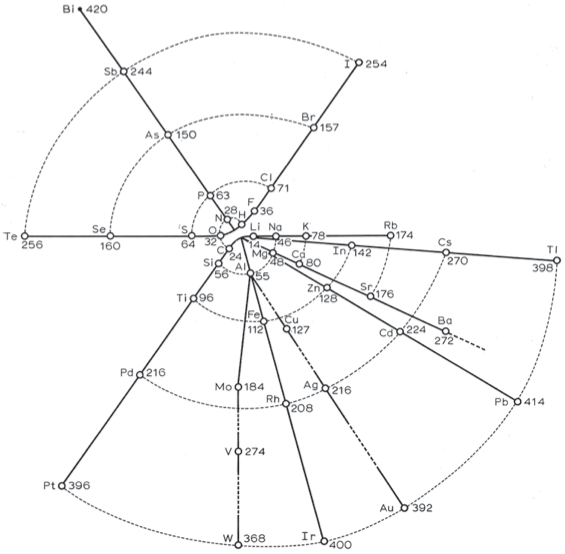 From here it would jump to a much larger orbit, in which it would touch eight bodies and then another equal, also of eight. 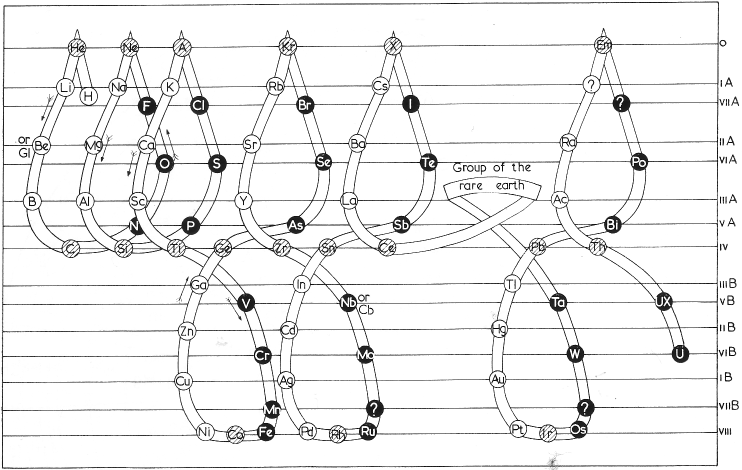 From here, another jump to a much larger orbit, comprising eighteen bodies, and then another equal; from this point one jumps to another orbit, again augmented, comprising thirty-two bodies (including rare earths); and when this round is over, the last one begins, to vanish a short distance. "In the dialectical grouping of the elements, which I have the satisfaction of exposing, the classic arrangement of the same is respected. 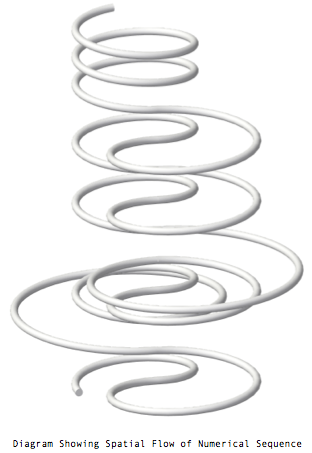 Only the arrangement changes, which instead of being rectilinear, is spiral. 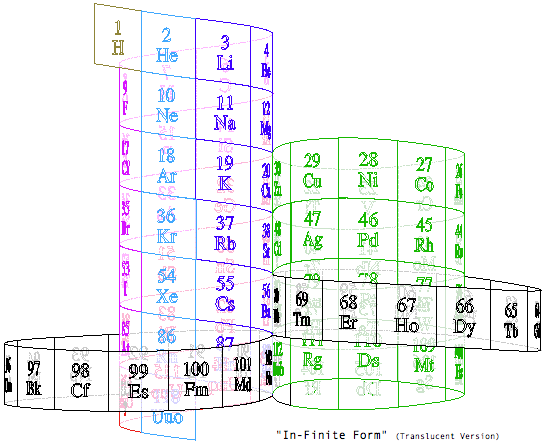 So I managed to suppress the anomaly of the double columns, and comfortably incorporate the important group of rare earths. 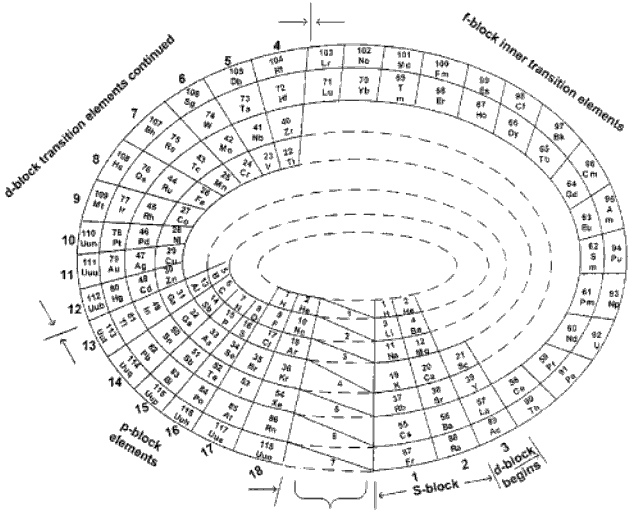 I can not give my graphic the name of Tabla, because it is just the opposite: it aims to give the idea of ? ?space, and of movement in space. The double columns of the Classic Table can be found here as well, but only if you look through the whole, considered as a planetary system of conical shape, with the electron at the vertex. 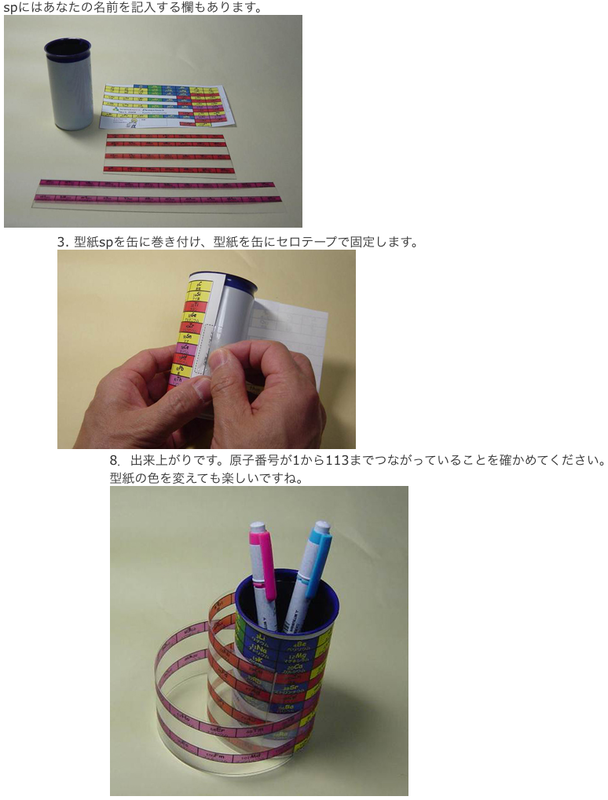 Effectively: column 1 coincides, through space, with column 1a; column 4 with column 4 bis, etc. 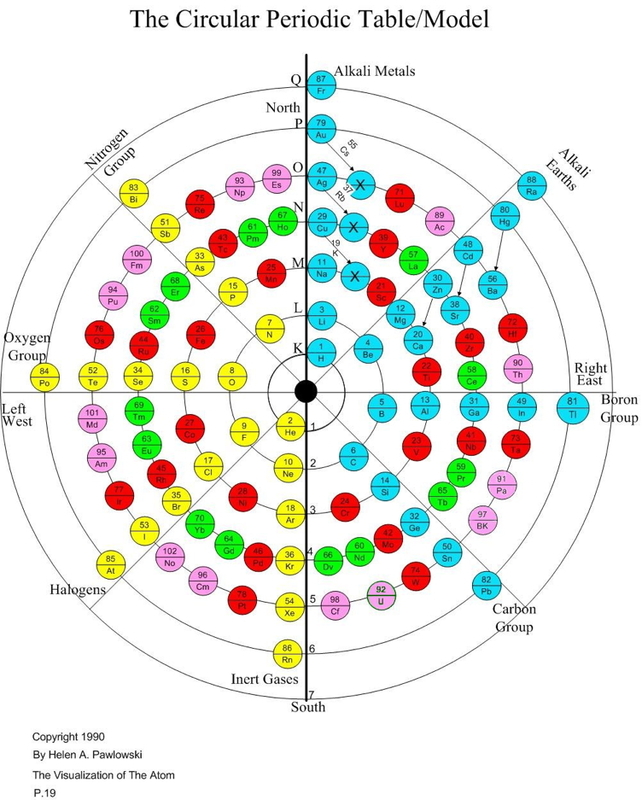 The dialectical grouping also allows us to easily appreciate the remarkable dialectical character of the properties of matter: these properties are repeated periodically. These are the "returns" to qualities or previous properties, but not exactly equal to those, but only similar: and this resemblance, only to a certain extent. 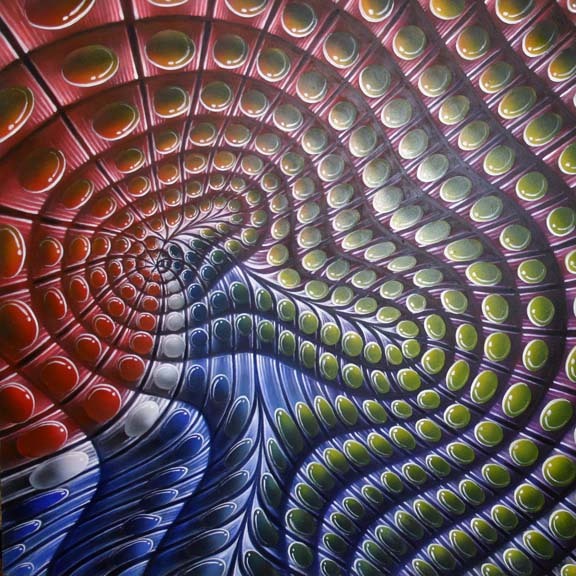 The difference is that that quality, those properties or some characteristic, are exalted to each dialectical return." 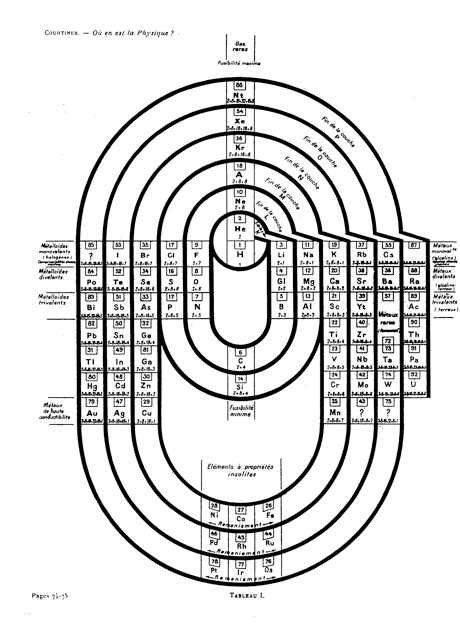 A spiral periodic table formulation constructed by E.C. Pozzi in 1937, from here. Origionally developed in 1933, the colour version of Clark's arrangement is from Life Magazine, May 1949. 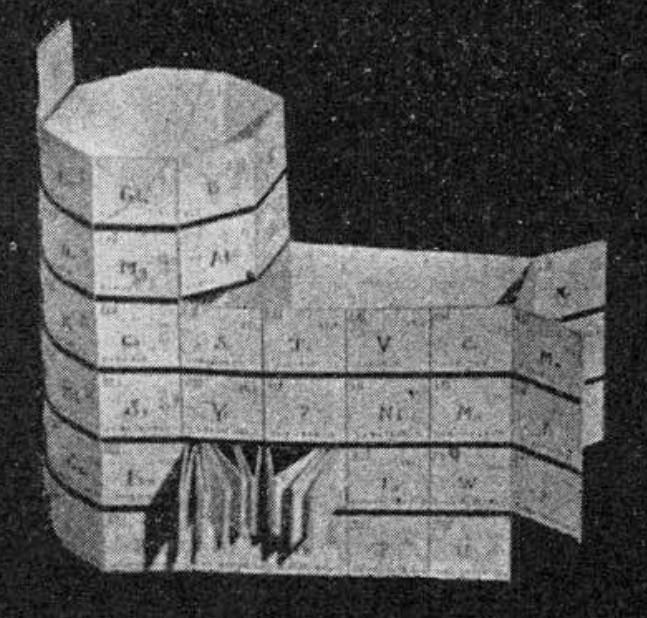 This was the model for Longman's 1951 mural. Information supplied by Philip Stewart. 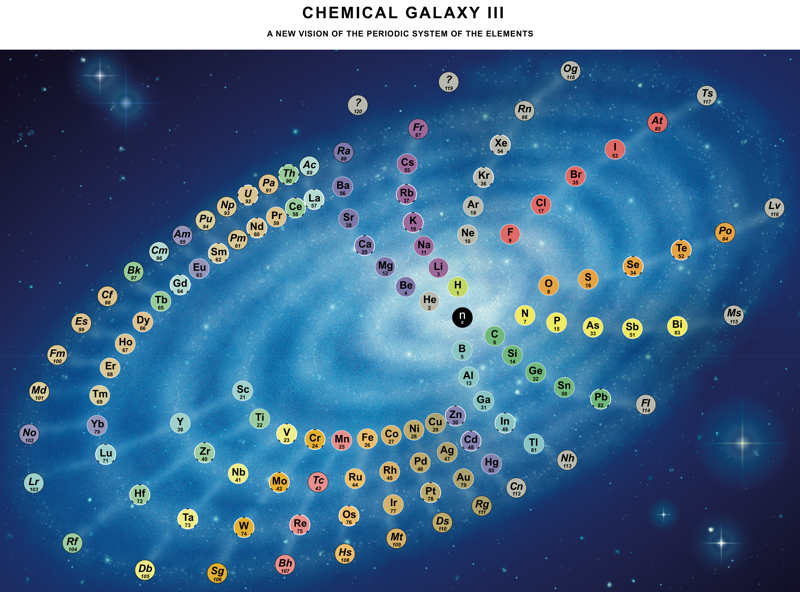 This spiral, inspired by Stewart's Chemical Galaxy, is based on the modern periodic table with the elements strictly arranged in the increasing order of their atomic number and in accordance with their electron configurations. 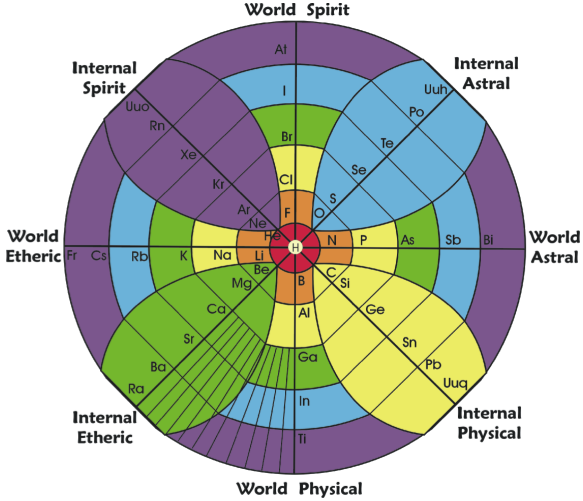 The spiral separates the elements into the eight dominant 'A' groups of normal elements, and the eight corresponding 'B' subgroups of transitional and inner transitional elements, which have been incorporated as the inner spiral. 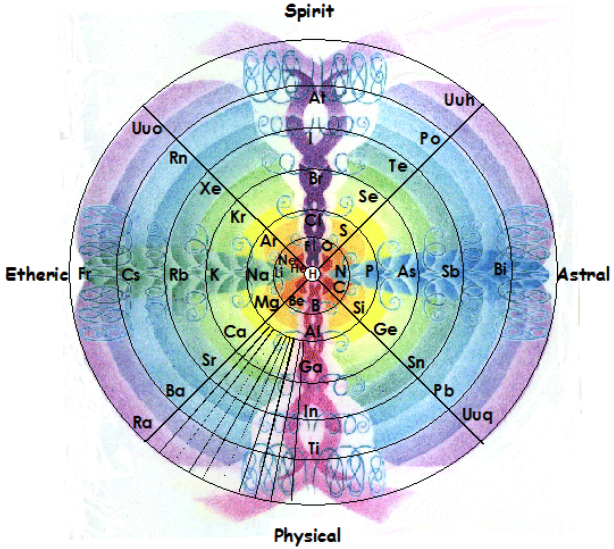 The organisation of the elements closely follows H.G. 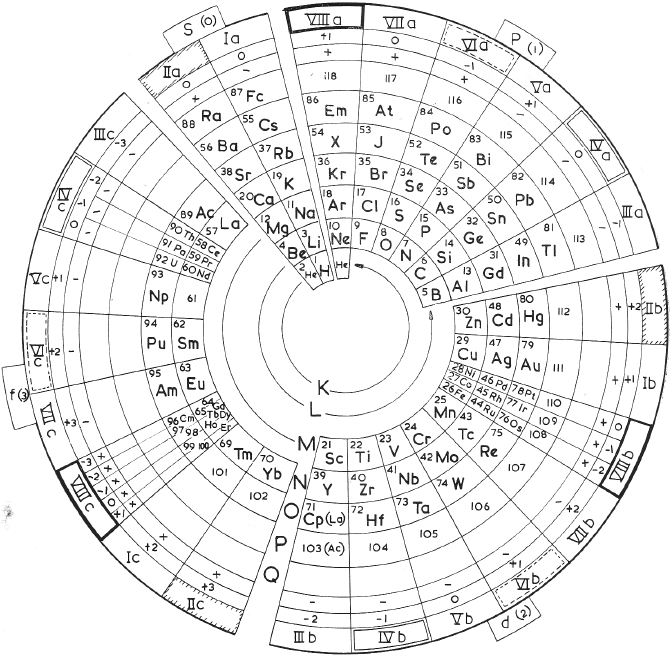 Deming's 1923 Periodic Table where A B numeration was first utilized to correspond the characteristic oxides of the 'B' groups to those of the 'A' groups. 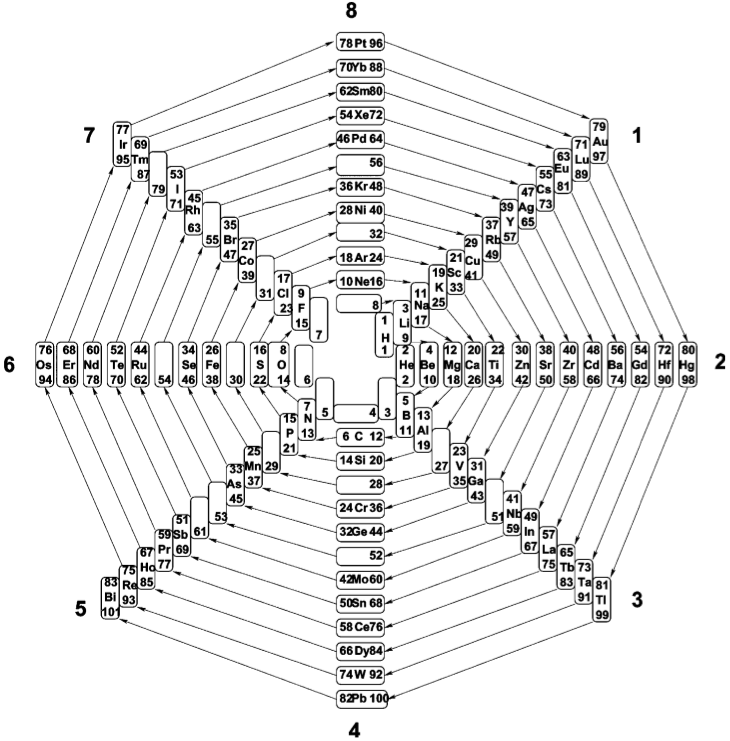 The result of this design places Group VIII, the triads Fe, Co, Ni, etc. 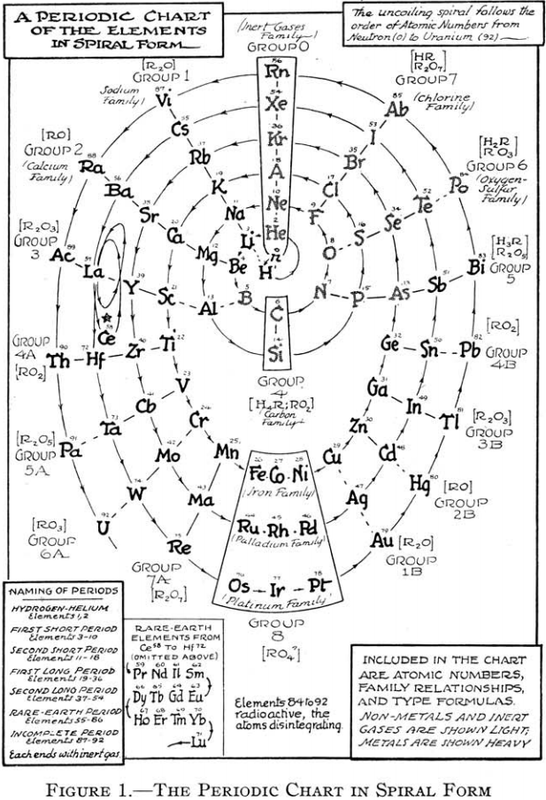 as a subgroup of Group 0 (or 18 Helium Group) which conflicts with some modern periodic tables, though broadly agrees with Deming's original proposal (VIIIA and VIIIB). 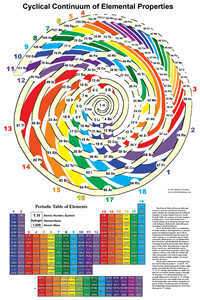 Hydrogen, which generally cannot be considered as part of any group, has been placed with the Fluorine group VII which appears its natural place in the spiral. 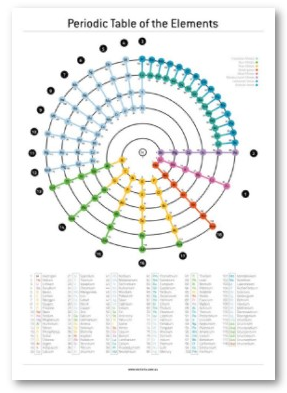 Common names have been used where practicable to make the table more educational and reader-friendly. 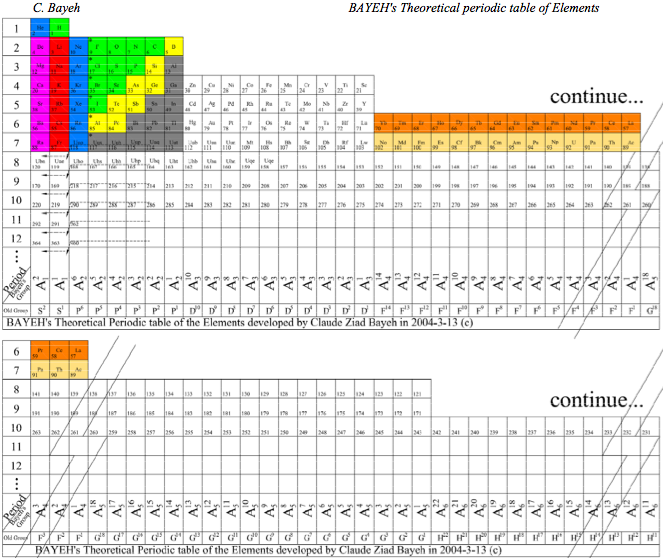 Element symbols have been included in the expanded poster of this table. 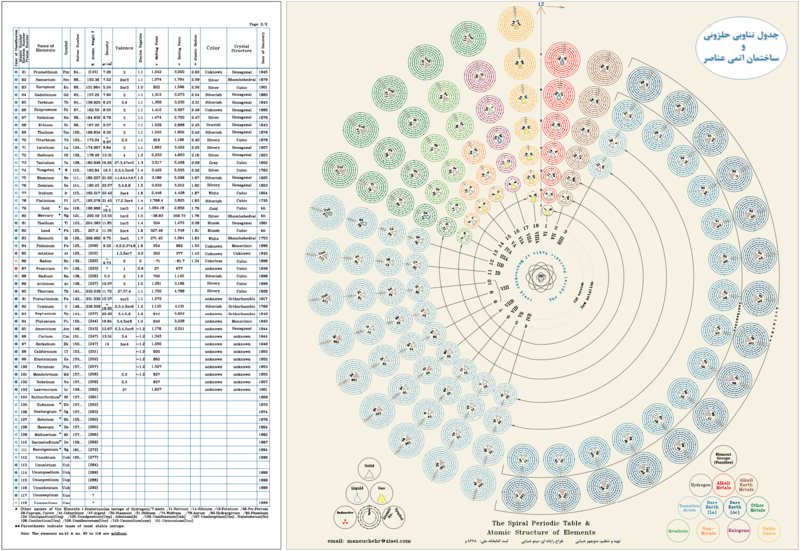 Look at a larger PDF. 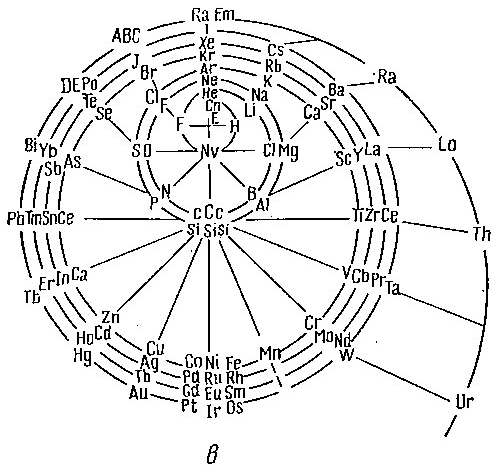 Page 8 of my website (in Russian) shows The Spiral of Atoms and Their Periodic Table, which depicts a spiral disk of atoms with a periodic table of their relative masses. 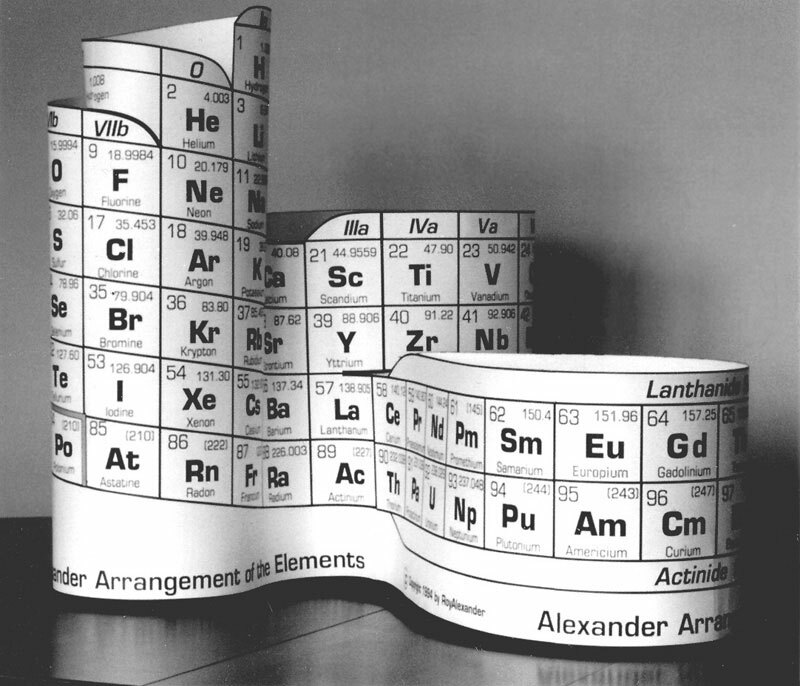 The design of the 2012 Alexander Arrangement of Elements (AAE) follows the principles of a three-dimensional model developed by Roy Alexander in 1965: a printed representation of element information based on strict adherence to the Periodic Law, with every element data box physically and visually contiguous and continuous within the sequence of atomic numbers in generally accepted element property related columns - "...the periodic table the way it's supposed to be". 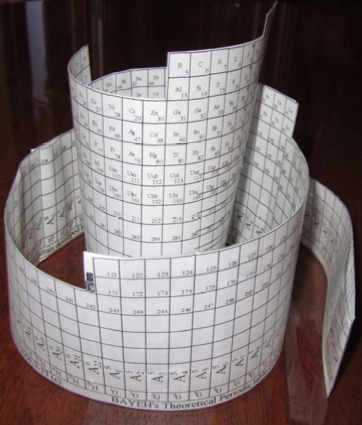 This is made possible by wrapping, folding, and joining the printed material and employing the patented p-block downslant of the element data boxes to allow the end element of a period to be adjacent to the first element of the next period. 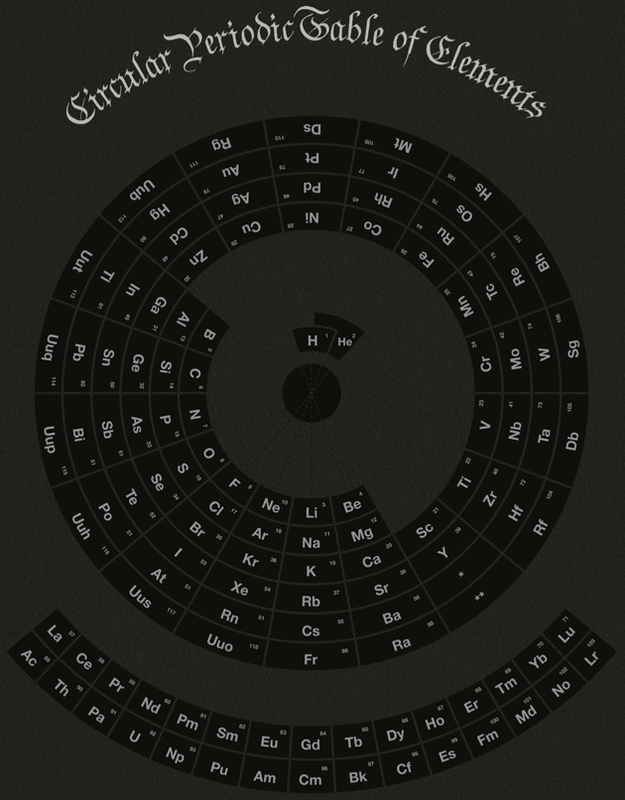 The visual effect mirrors the look of Theodore Gray's series of posters, books, element cards and periodictable.com website and apps for the Apple iPod and iPad. 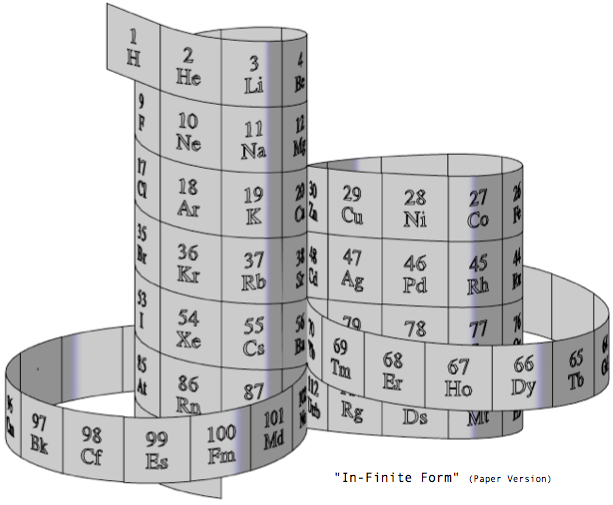 Each element box is dominated by a Theodore Gray element photograph, with the element name, letter symbol, and atomic number relatively large, often overlapping the photo. 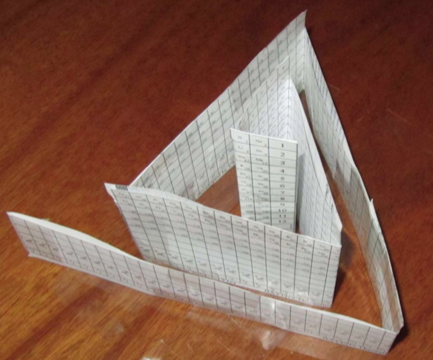 The period numbers (below, right) are printed at the interface of the end/beginning of the periods, folded 90 degrees on the model, and the blocks and columns (old & new numbers), are identified below the data boxes - and in the case of the Actinoids, above. 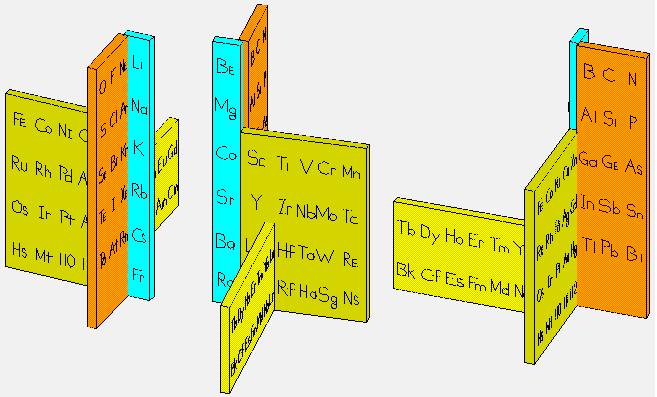 The element blocks connect at a central nexus (below, center), with the d- and f-blocks leaving, looping, and returning there, thus allowing the shorter period gaps above to be closed. 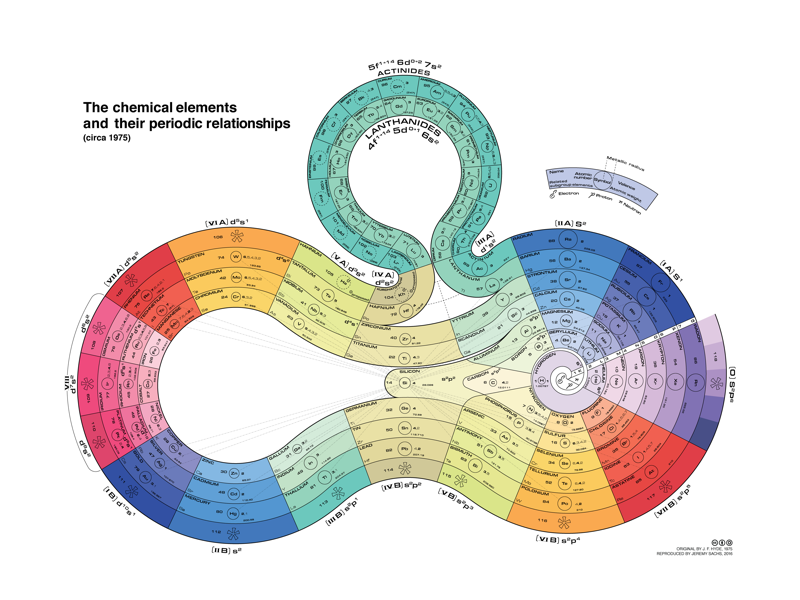 For best visibility of the element data, these loops pinch together near the intersection. The p-block bends in a half-circle to join the s-block at the corner described above, with a patented 'downslant' where the element boxes gracefully sweep down a full box height (above) within this block to allow elimination of the "carriage return" effect: each period ending on the row above the next. 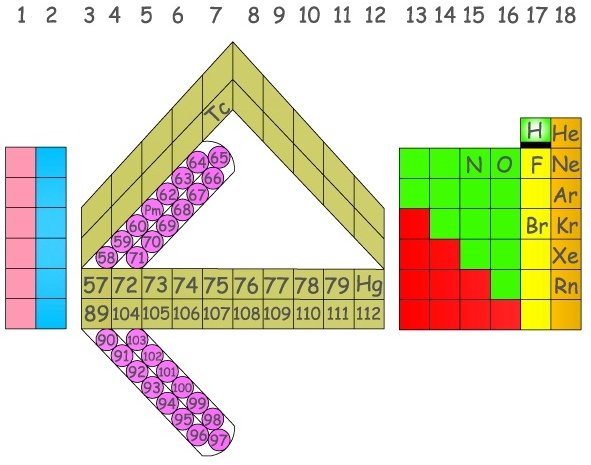 The extended Hydrogen data box, a characteristic of all Alexander Arrangements, is more extended in this model, reaching for the multiple positions of the H box that are still under discussion among experts. The extra-extended Hydrogen box, illustrated by a composite image of a hydrogen cloud in space, (above, right) loops over the s- and p-blocks. 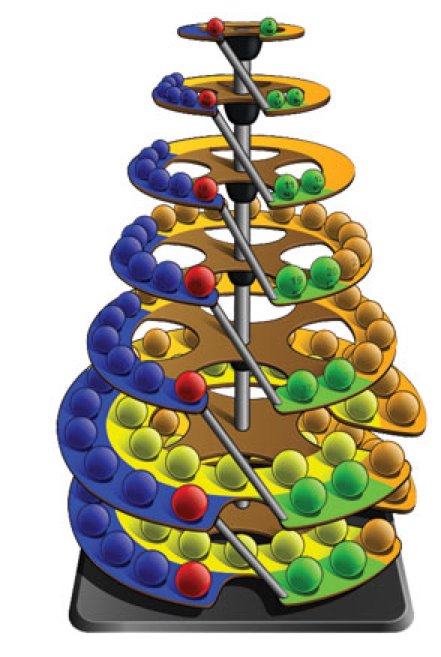 Starting up from behind the corner of Helium & Lithium, inside the half-helical tube to loop over Helium, attach above Lithium, Beryllium and then Carbon as the loop descends (joining the ascending portion) over the data boxes of the s- & p-blocks, terminating in contact with Fluorine, Neon, and corner-on to Neon. 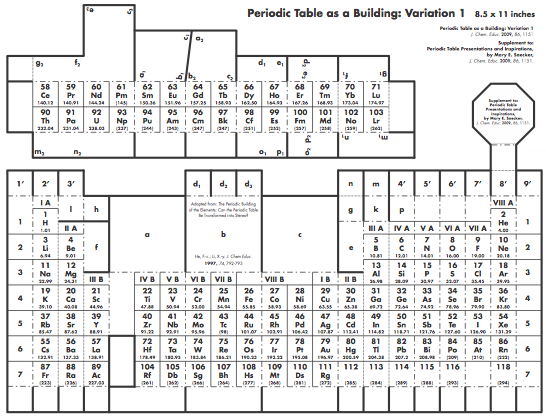 The model size is the same as the previous Display Version of the AAE, but has fewer element data boxes, due to there being no photos of the lab created elements and for simplification of the educational application - introduction to property periodicity and organization of element data - the elements with atomic numbers over 94 are not included (see addendum). 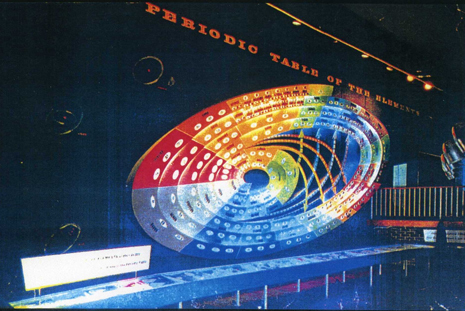 Designed by Roy Alexander, a science museum exhibit and teaching aid designer, the Adobe Illustrator art for the model was started by Ann Grafelman, and continued by Roy from mid 2011 through November of 2012. 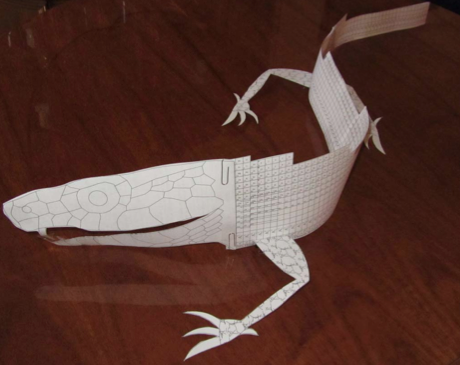 Photos were provided by Theodore Gray, and Element Collection funded the printing and die cutting performed by Strine Printing in York, Pennsylvania. 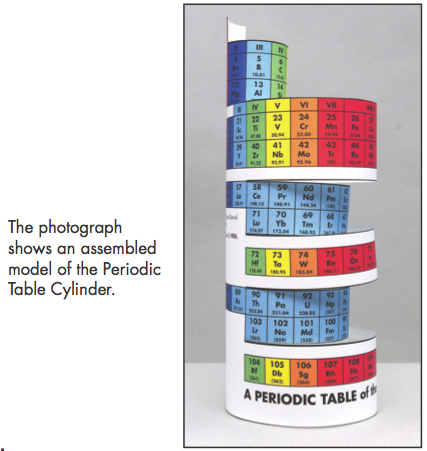 The model kit was first offered at Theo's PeriodicTable.com, then at Roy's AllPeriodicTables.com and the new 3dPeriodicTable.com, which site is dedicated to the 3D Forever Periodic Table only, with add-ons, application suggestions, and descriptions and commentary of all sorts. 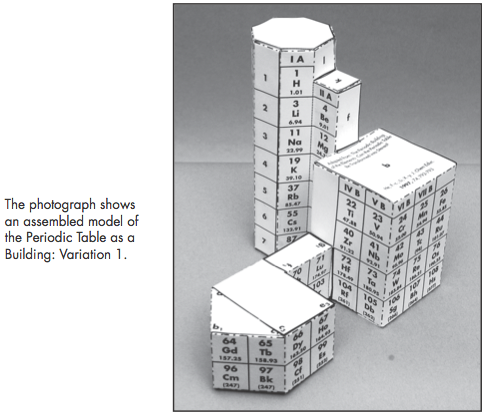 Text relating to the abbreviation of the ever increasing number of elements is explained at two places on the 3D AAE illustrated periodic table model kit. 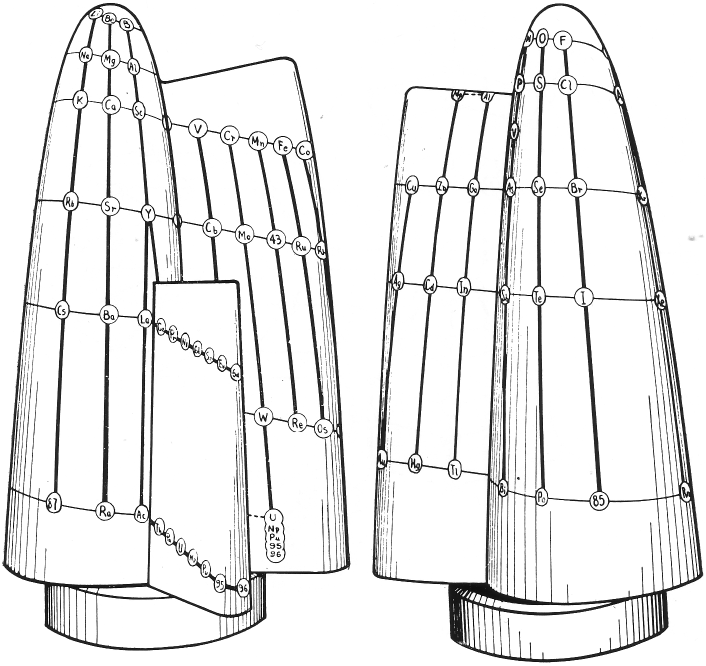 One will remain with the model and one is removed at the time of assembly. 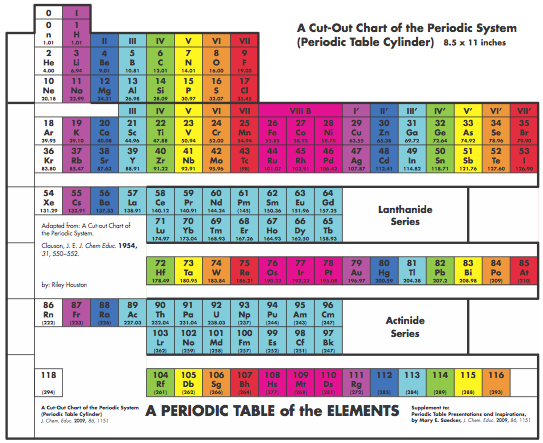 The lab created elements ordinarily found in this part of a periodic table are not to be found in nature, there can be no photographs of them, so nothing needs to be added to this element photo periodic table - ever - so it will never be obsolete, a Forever Periodic Table. 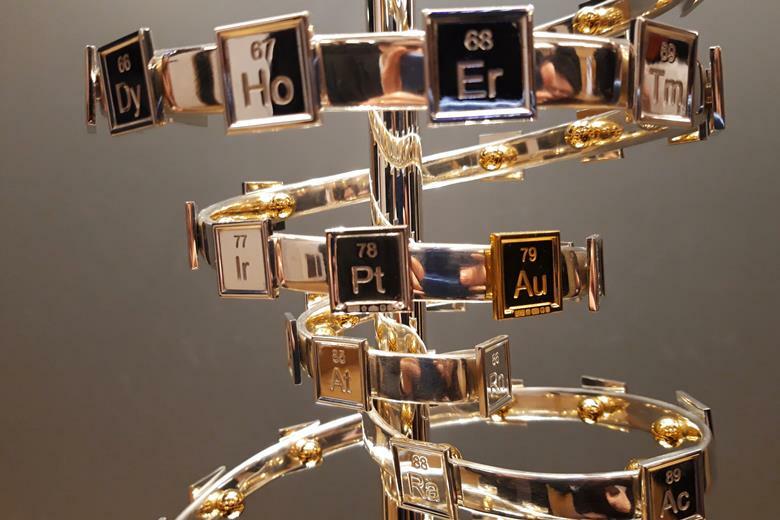 Naturally-occurring elements have been numbered variously, generally between 80 and 96, all for cogent scientific reasons. 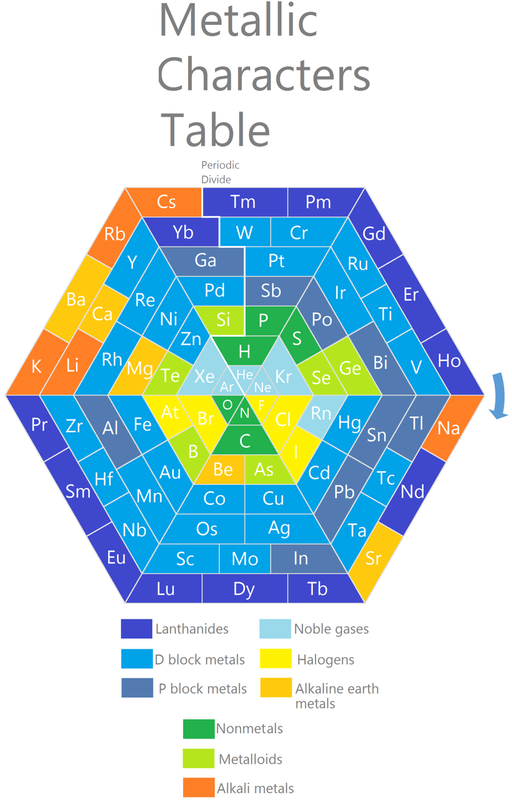 For easier teaching and learning, we have included on this periodic table only the 92 elements actually currently existing on Earth and in the remainder of the Universe, and adding Technetium and Promethium, which, although they may have no stable forms, serve to fill what would otherwise be gaps in the sequence. 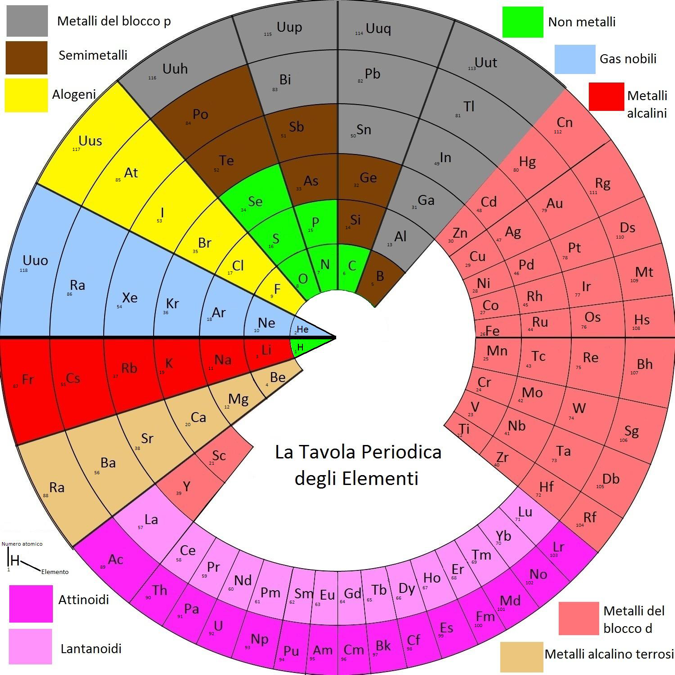 Not added for practical and educational reasons are 'elements' consisting only of pages and pages of computer data from smashing atoms in particle accelerators. 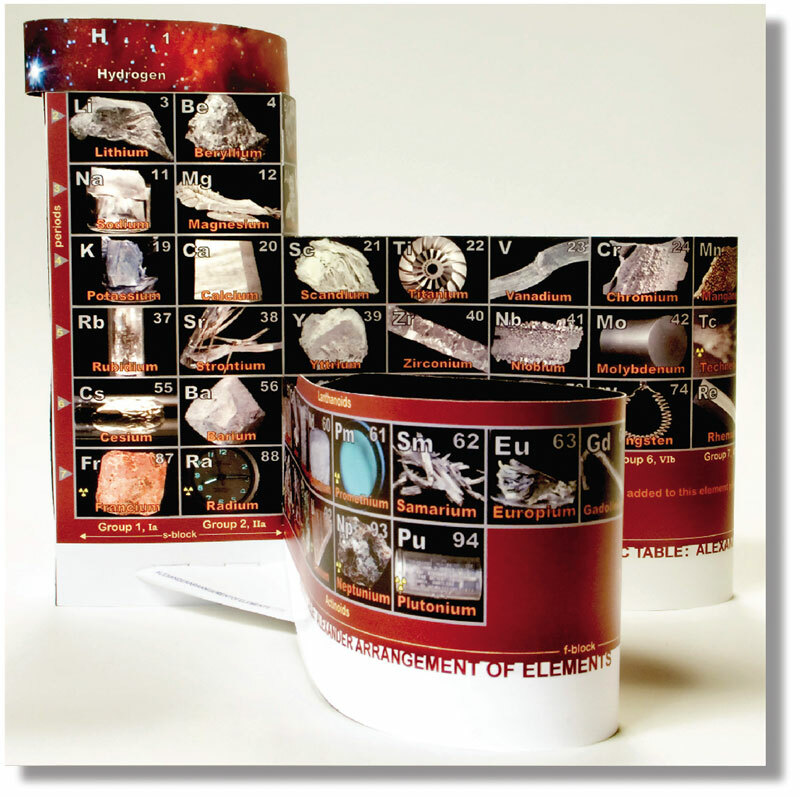 Another reason is that there can be no photographs of them to show, and as a result, your arrangement is complete and never be obsolete - your Forever Periodic Table. 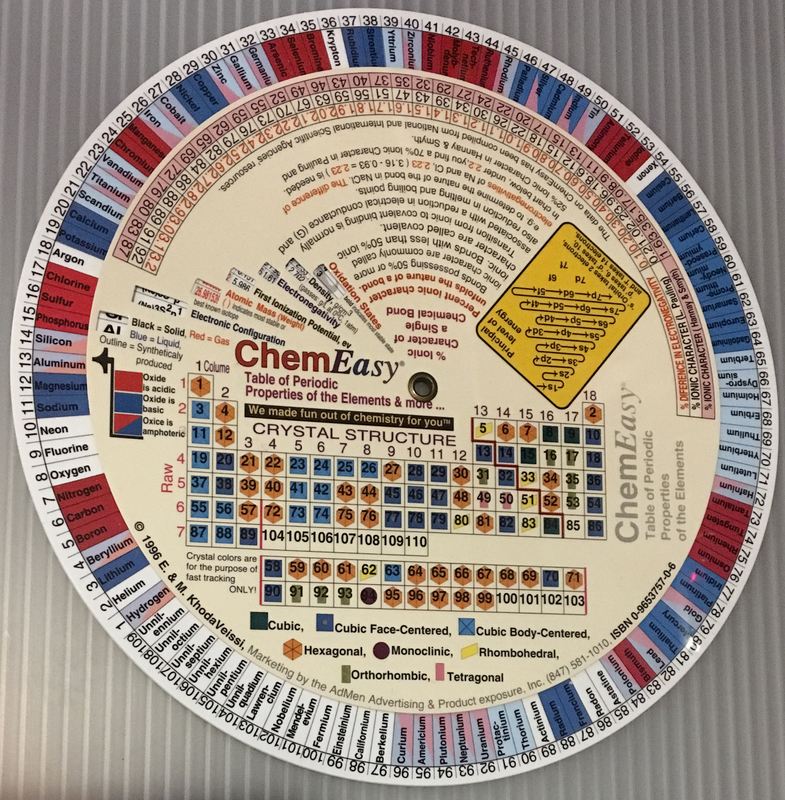 Included with the art of the periodic table on the die cut substrate that makes up the model is some background information about the the history of three dimensional periodic tables. 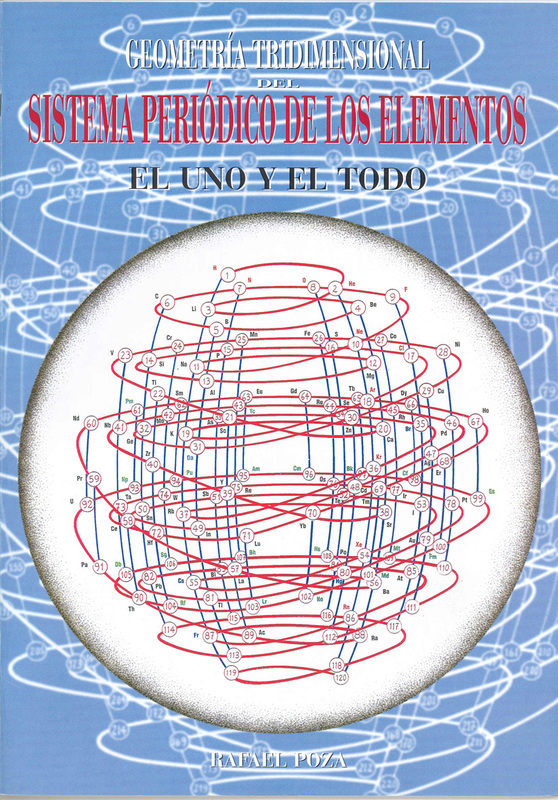 The first of these is about the discoverer of the concept of arranging the elements in periods suggested by the properties of the elements, de Chancourtois. 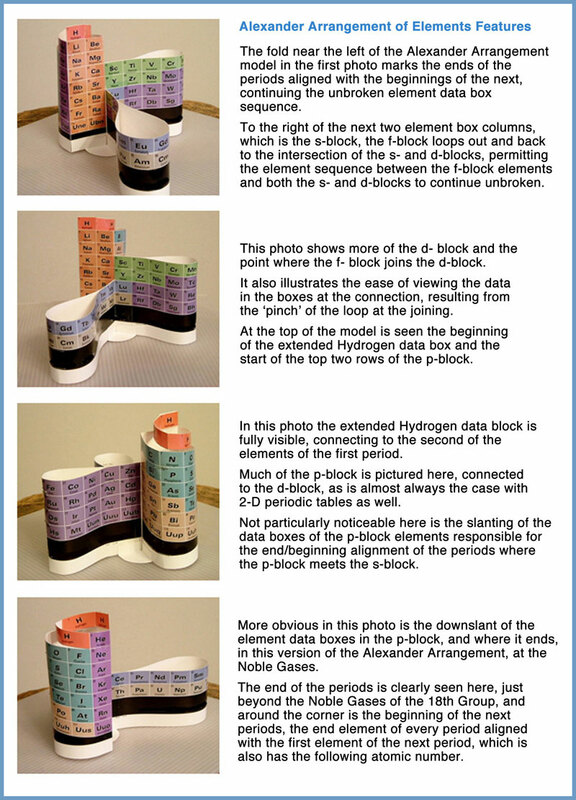 The second 3D periodic table information piece (on the rear of the de Chancourtois removable card) are sketches of a number of the 3D periodic tables found on the Chemogenesis website. 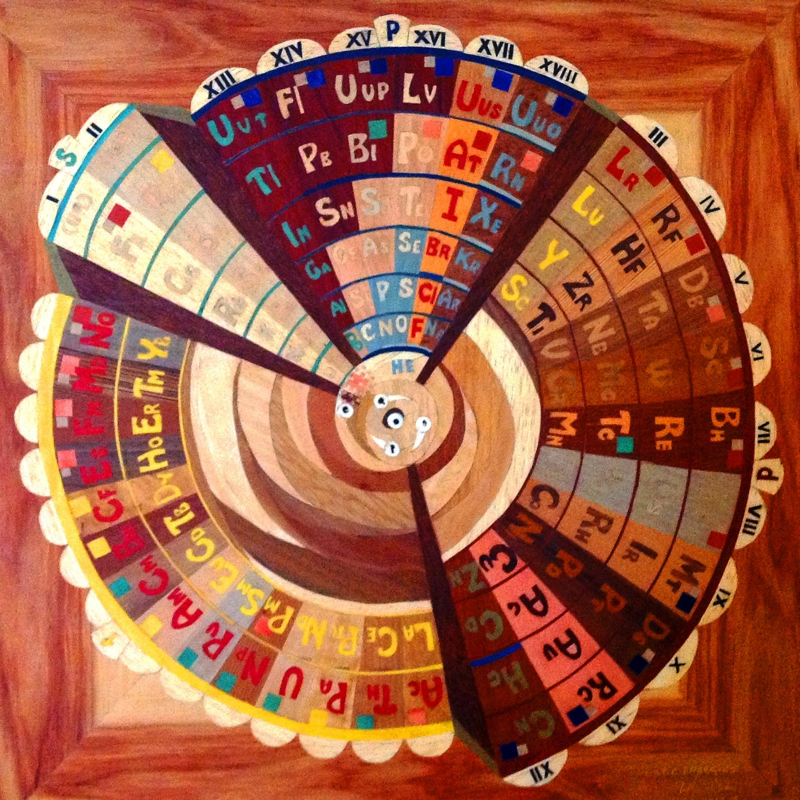 "My vortic periodic table created in marquetry may be of interest. I have always thought of vortic energies and with retirement time, I used my Marquetry Hobby to so create. 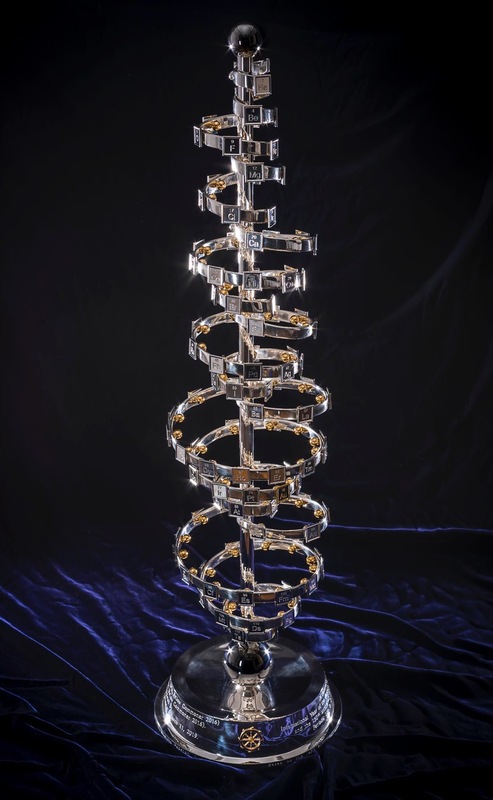 Despite the inevitable Black Hole centre I have included the Higgs Boson there as a tribute to its discovery and potential as a window to elsewhere." 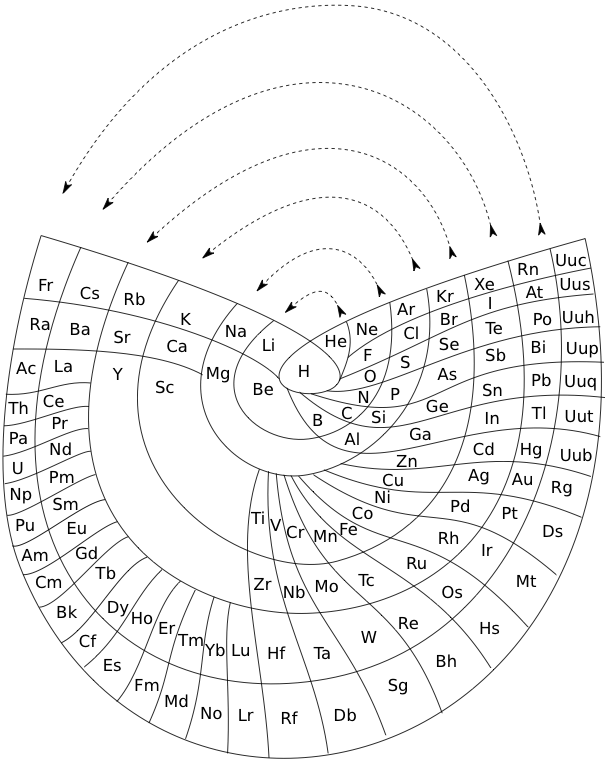 From Facebook, a Wheelshaped table of elements. Please note the symmetry of this representation. and, logically, neither first nor last factor can be 0 or -2 (they differ in two columns above respectively by 2 and 4). 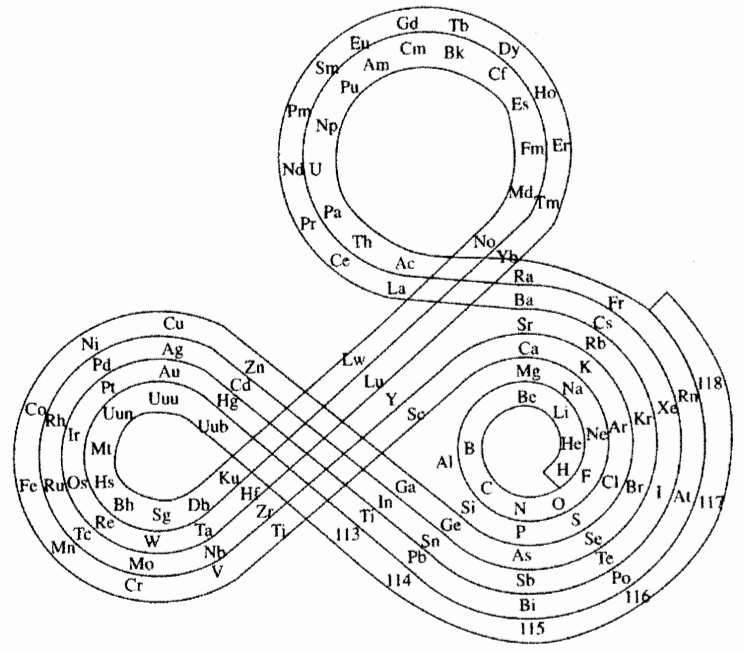 On the other hand, the coherence of the structure requires the existence of two additional elements at the beginning! 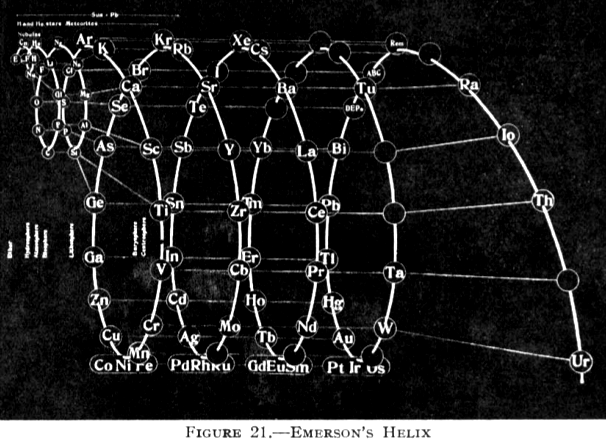 "The present invention relates to a device for the understanding of the periodic table and the structure of the atom together in a better way. 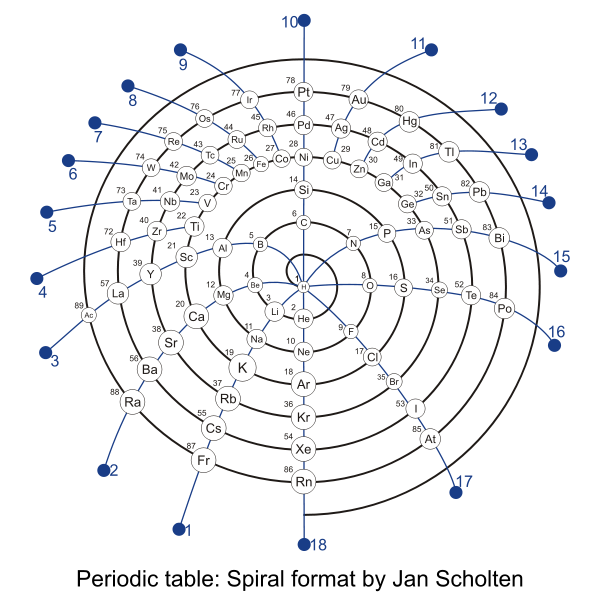 The device consists of seven concentric circular disks rotatable about their centre, wherein the size of the disks increases from the centre to the end like that in the structure of the atom. 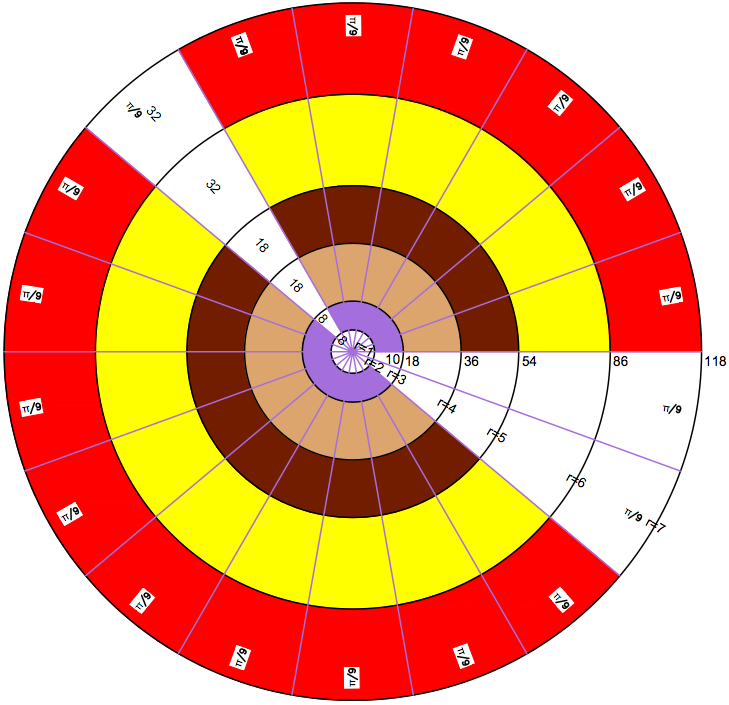 Each disk is marked so as to form the sub-blocks and each disk in itself represents the periods of the periodic table. 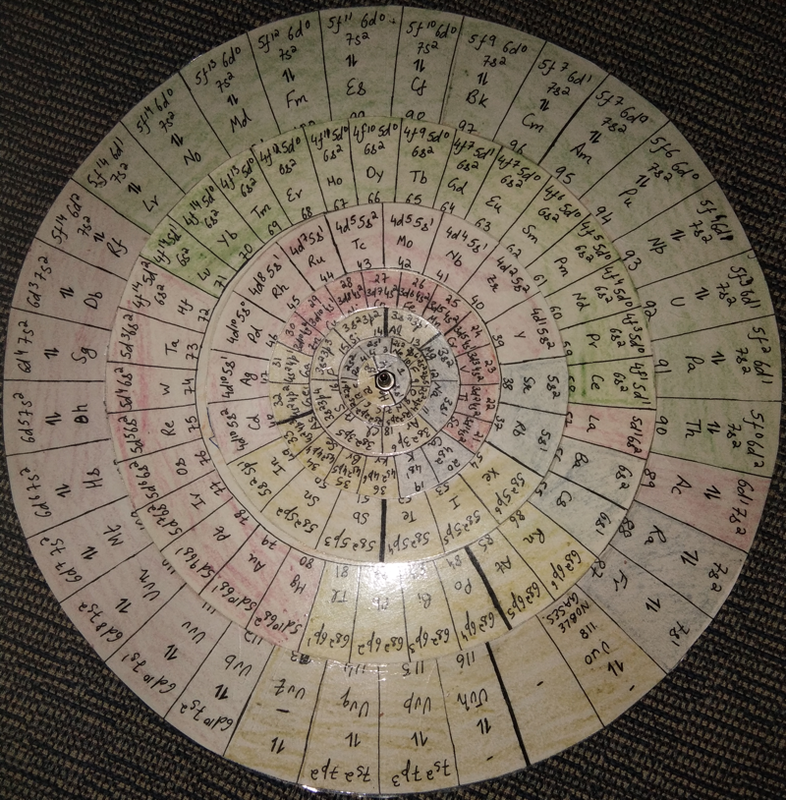 The disks are divided into sub-blocks and labeled with elements at back side as well. 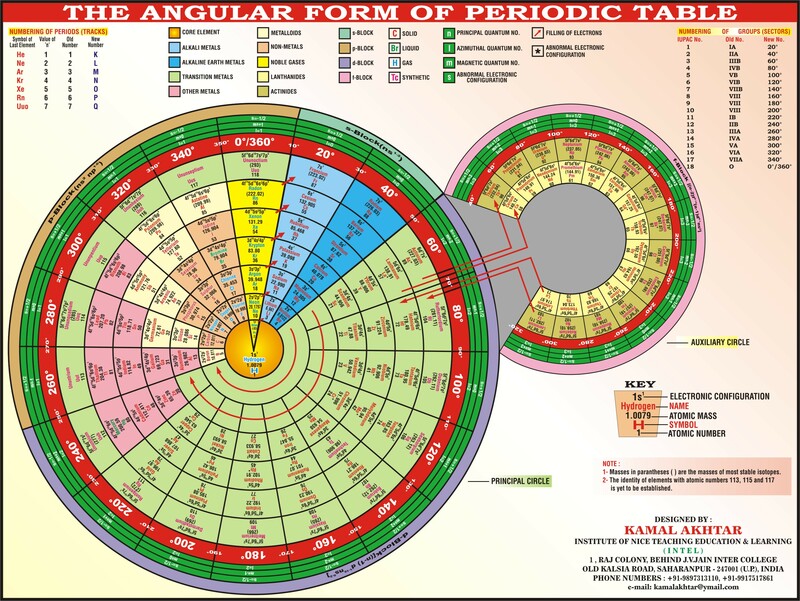 Thus the Ato Circular Periodic Table, as the name suggests, is the combination of atomic structure of the atom and that of the periodic classification of the elements." Read more in the pdf file which describes the new formulation in detail. 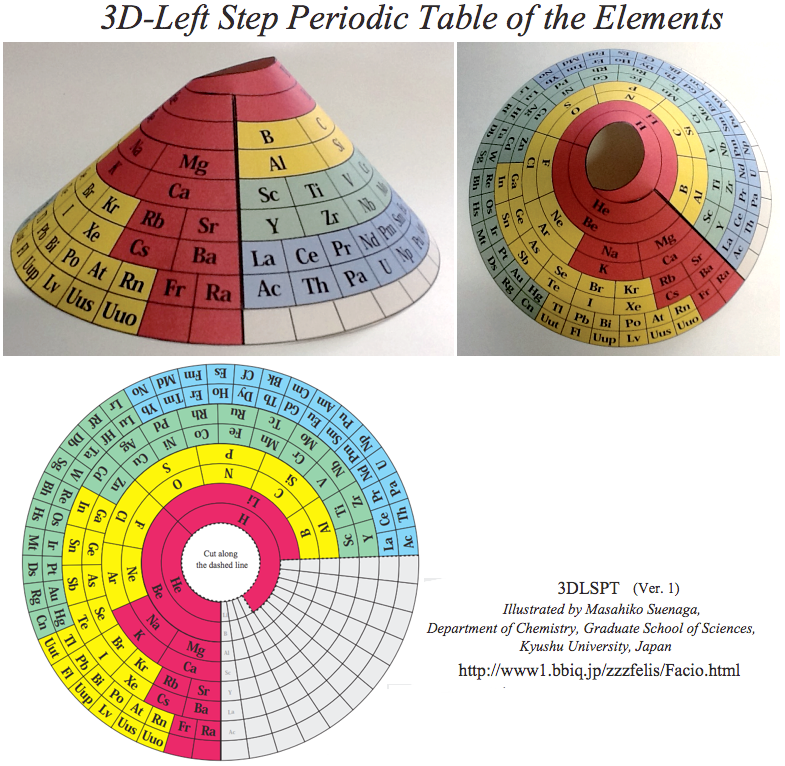 By Masahiko Suenaga, Kyushu University, Japan a 3D Left Step Periodic Table. 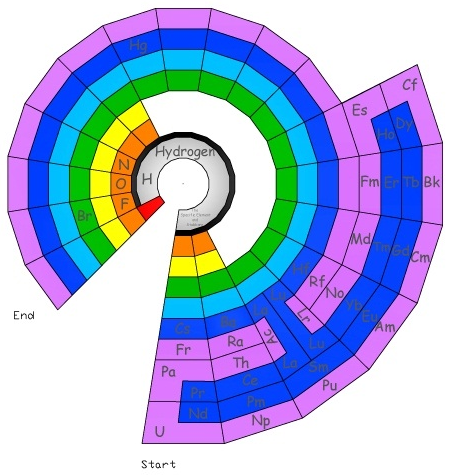 The Bernard Periodic Spiral of the Elements (BPSE), depicts a novel rendition of the Periodic Table that replaces the flat rectangular format with a continuous unidirectional spiral that maintains all the properties of Group and Period formation. Comparisons may be made with similar models spanning the last three decades of the 20th century (Alexander, 1971; Mazurs, 1974; & Kaufman, 1999). 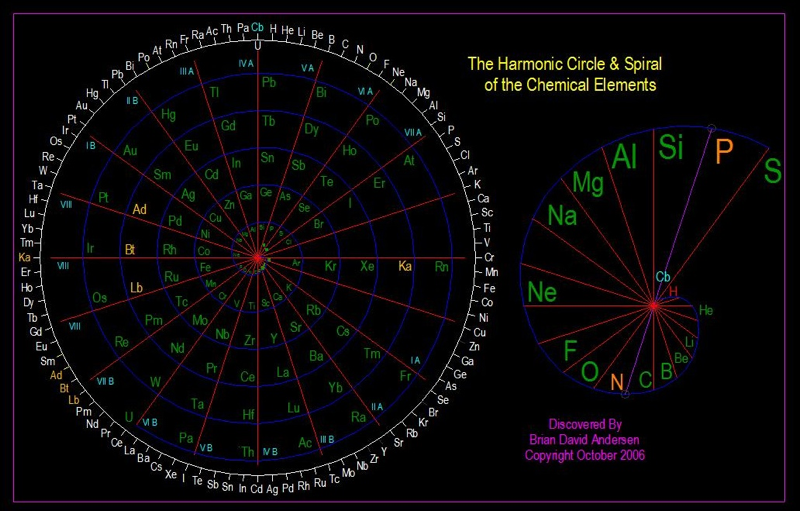 In the chart form, this new rendition is referred to as the Elliptical Periodic Chart of the Elements. 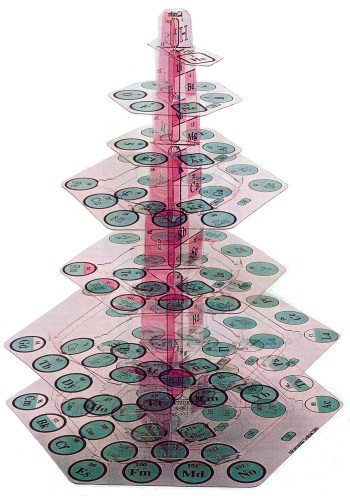 In the three-dimensional form, the model resembles a Christmas tree in shape with the 7 Periods represented as circular platforms situated at various levels with the elements placed appropriately at the outer edges of each of these platforms as a Period builds up. 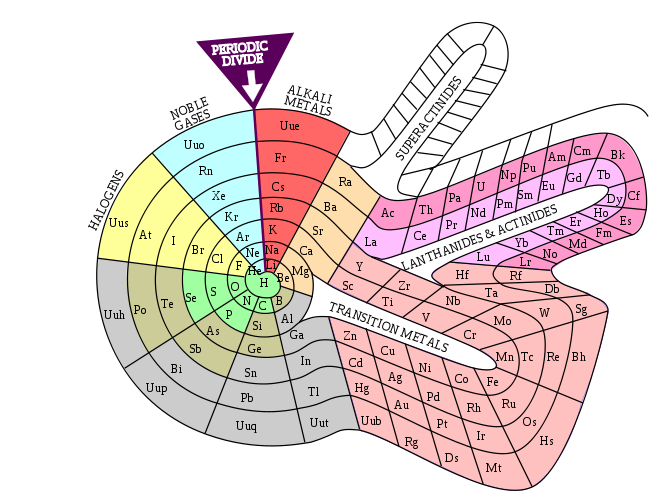 The elements may be represented as spherical objects or flat discs with radii proportionate to atomic radii (or reasonable approximations). 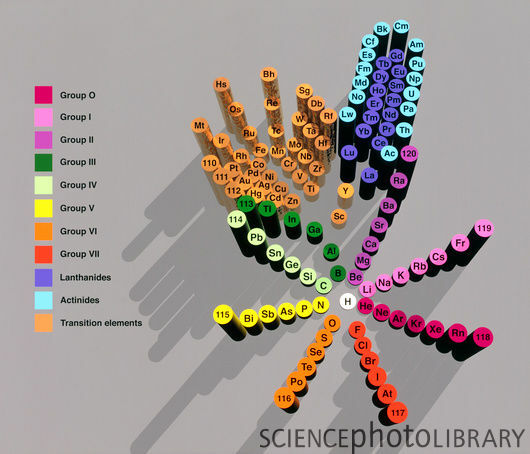 Color schemes accentuate the four different Blocks of elements: the s-Block (green), the p-Block (blue, with the exception that the last Group is red signifying the end of a Period), d-Block (orange), and the f-Block (yellow). 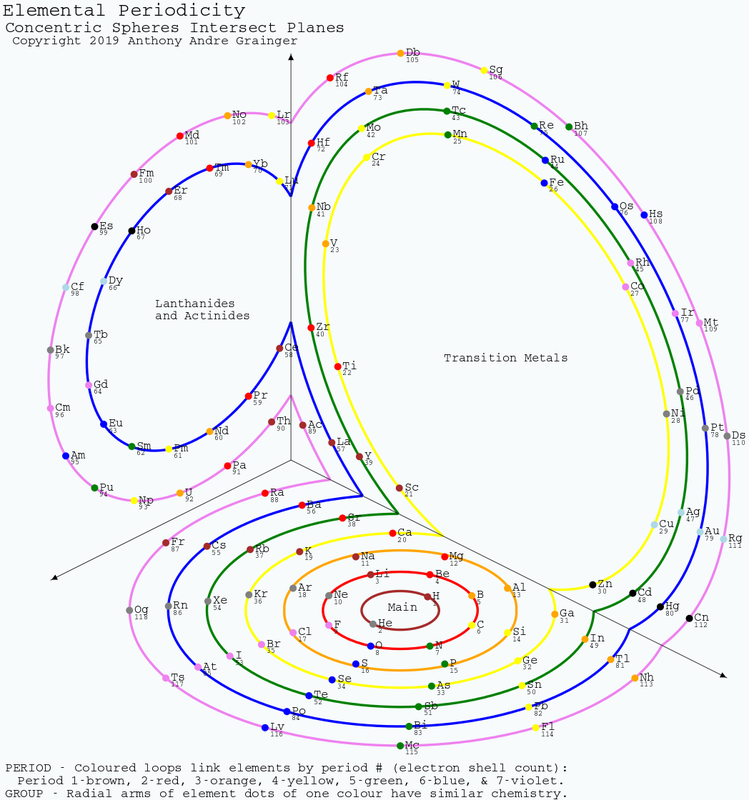 The grey section, called the Group-Period Interchange, is where the end of a particular Period connects to the beginning of the next Period, and, at the same time, transitions from Group 18 to Group 1. 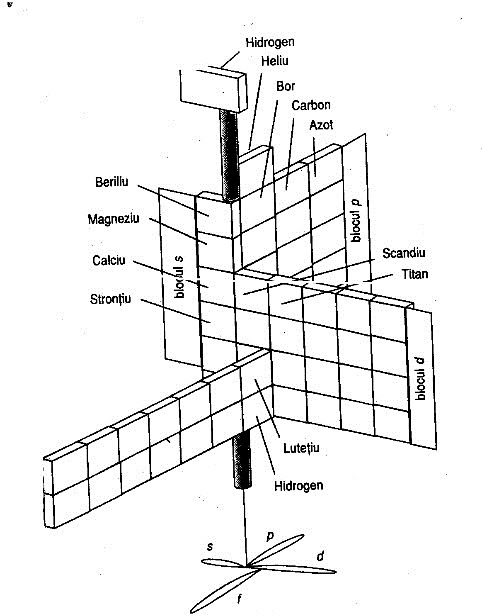 MONOGRAPH ON ATOMS, BY Dr. N. Naveen Chandra, 543 Bellamy Road North Scarborough, On, M1H1G5, 416 439 6630, chandraalex@hotmail.com >© N.Naveen Chandra, 2014. 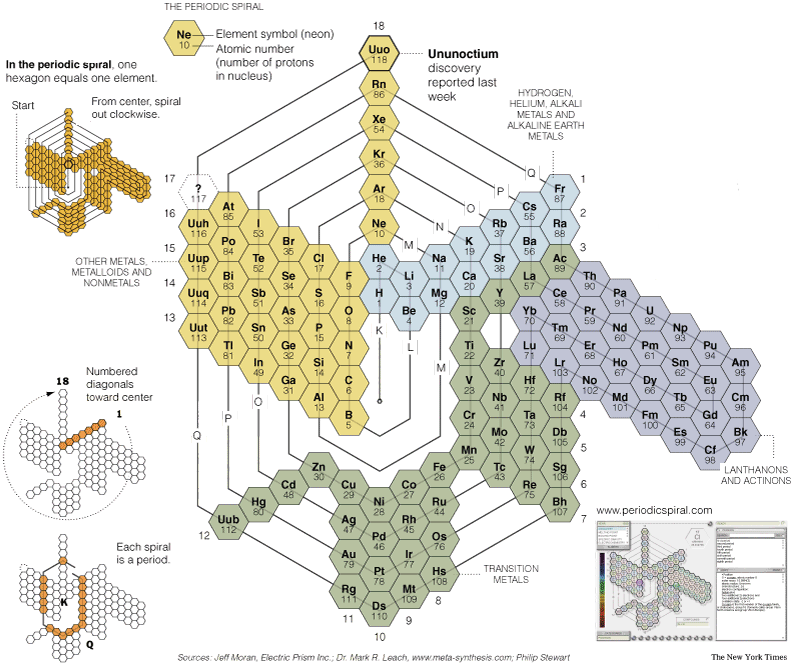 A new way of graphical representation of atoms is developed and presented here. 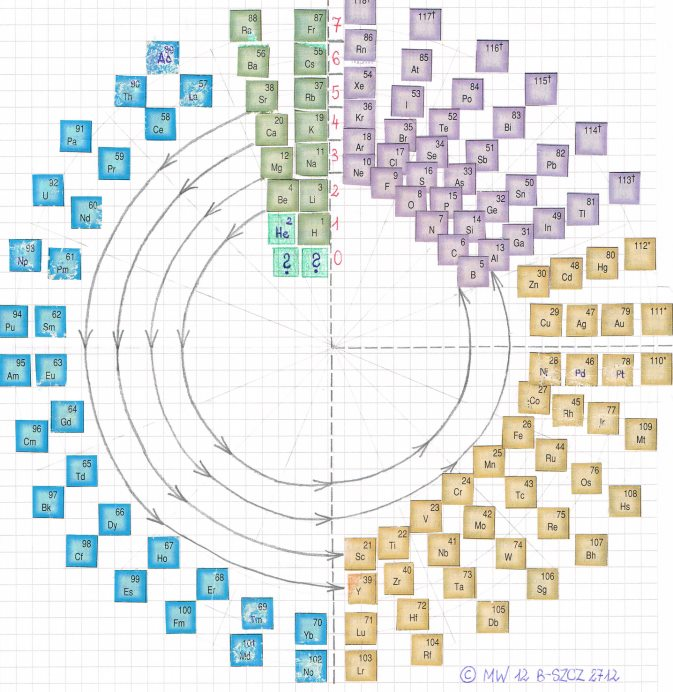 Atoms are recognized as functions of two variables A(r,Θ), where r =2,10,18,36,54,86,118 (given arbitrarily r=1,2,3,4,5,6,7) represents period and Θ representing group, is actually the angle between the groups. 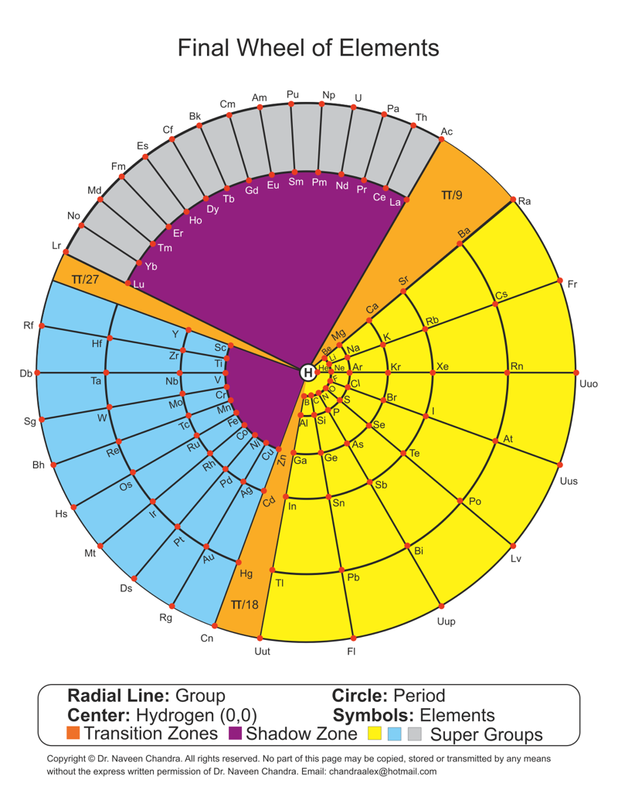 A mathematical solution is obtained for Θ having three distinct values of (π /9) radians, (π/18) radians and (π/27) radians which define three super groups satisfying the equation 15(π/27) +10(π/18) +8 (π /9) =2π. 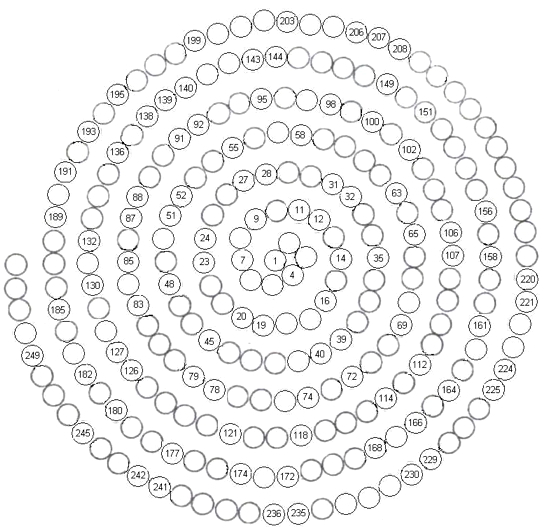 15 groups of two Atoms with a transition zone of (π/27) radians is nominally called Grey Super Group (GSG). 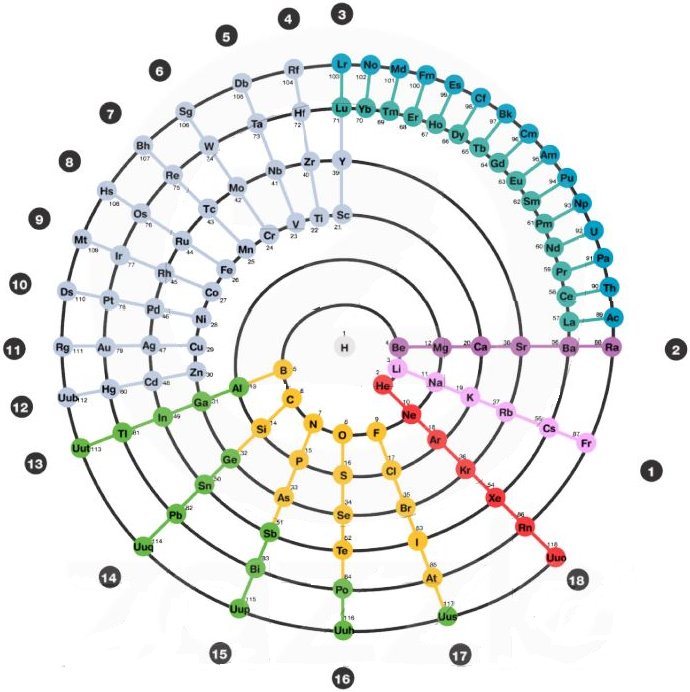 10 groups of which 9 have four Atoms and 1 has two Atoms, also including a transition zone of (π/18) radians, is nominally called Blue Super Group (BSG). 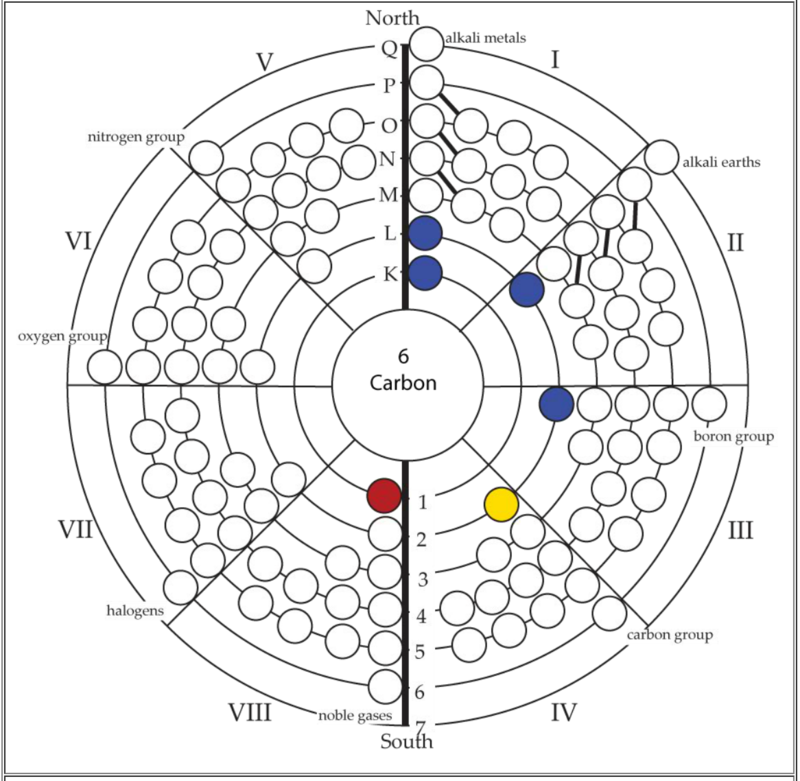 8 groups of which 7 have 6 Atoms and one has 7 Atoms, including a transition zone of (π/9) radians is called Yellow Super Group (YSG). The group with 7 atoms is the so called reference group of Atoms 2, 10, 18,36,54,86 and 118. 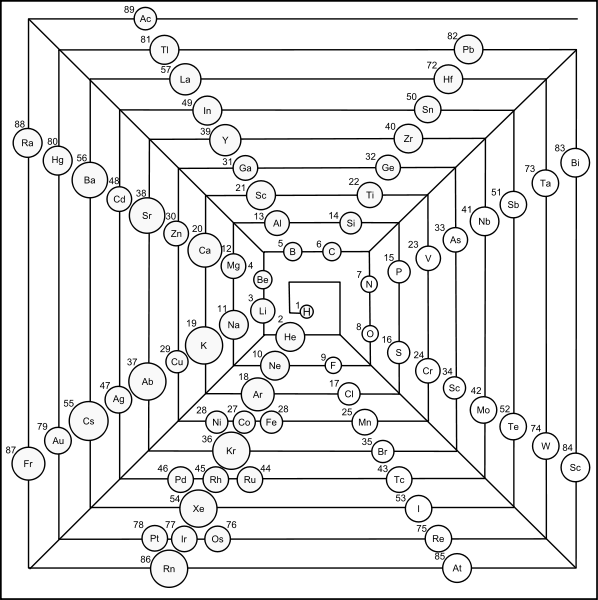 The GSG has 30 Atoms, the BSG has 38 Atoms and the YSG has 49 Atoms. 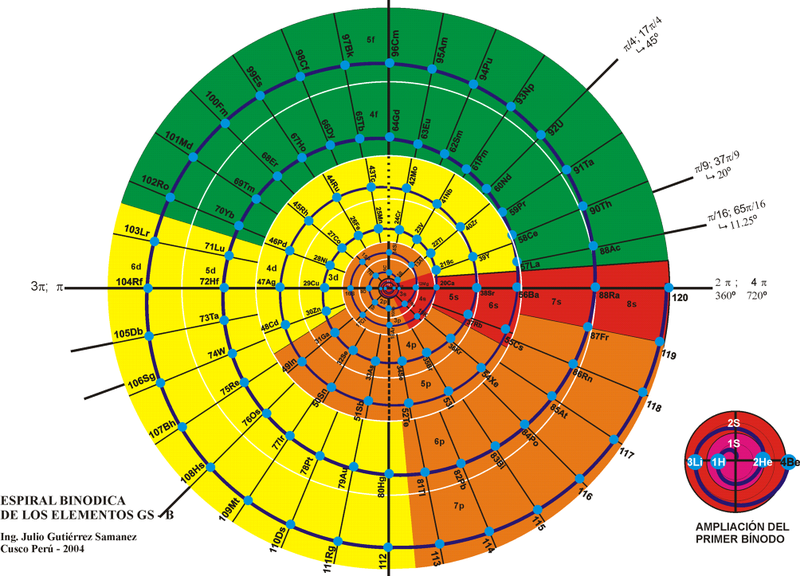 The Atom 1 is at the centre of the Hub and does not belong to any group or period and has coordinates of (0, 0). 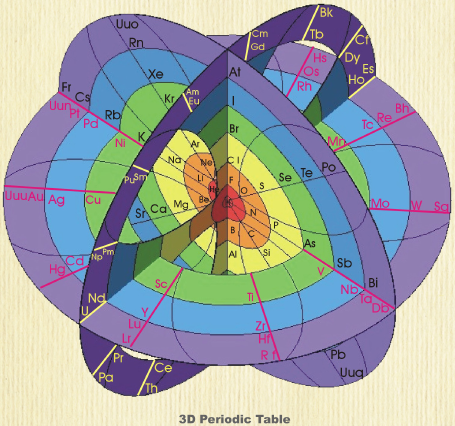 Atom 1 having no neutrons is unique. 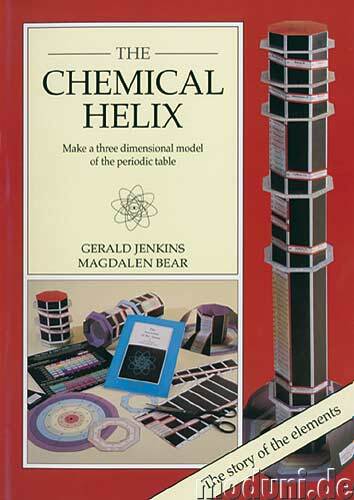 "I would like to submit you an hexagonal periodic table. 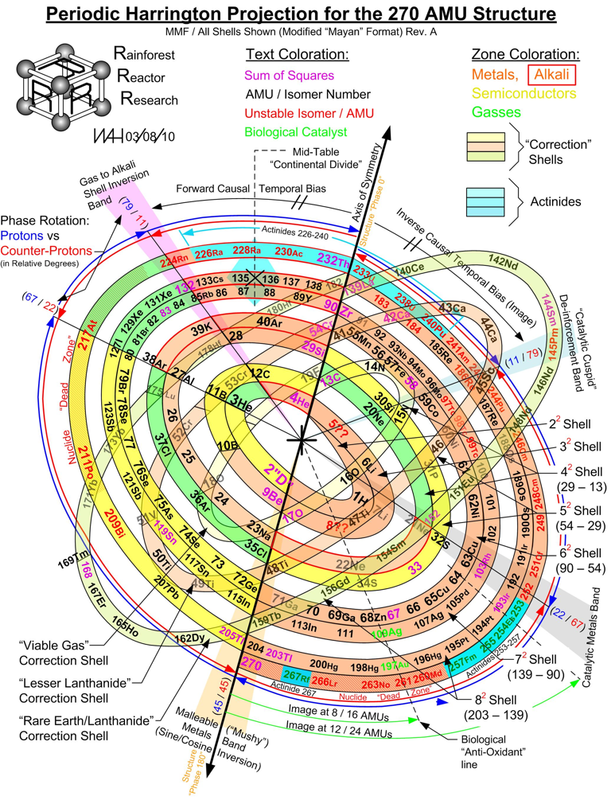 It's structured in different rings. 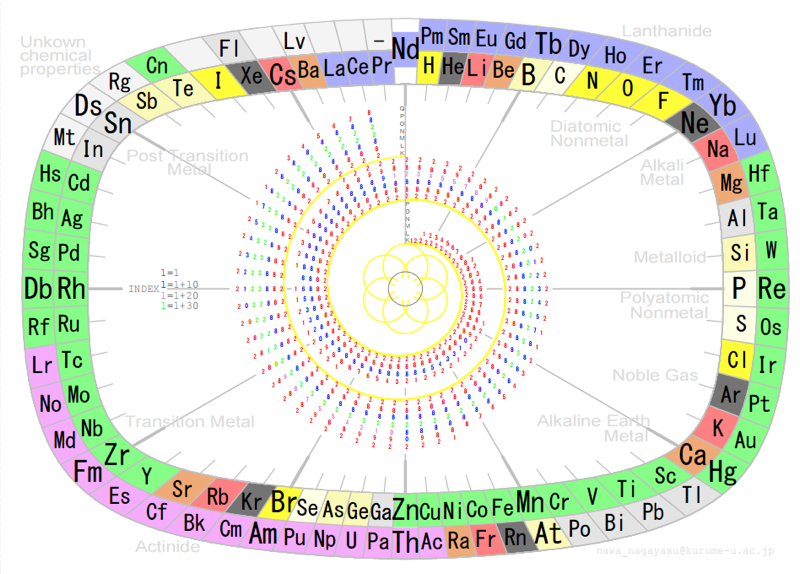 The elements are ordered on their metallic characters so in the inner rings there are noble gases and nonmetals while in the outer rings there are alkali and alkaline earth metals. 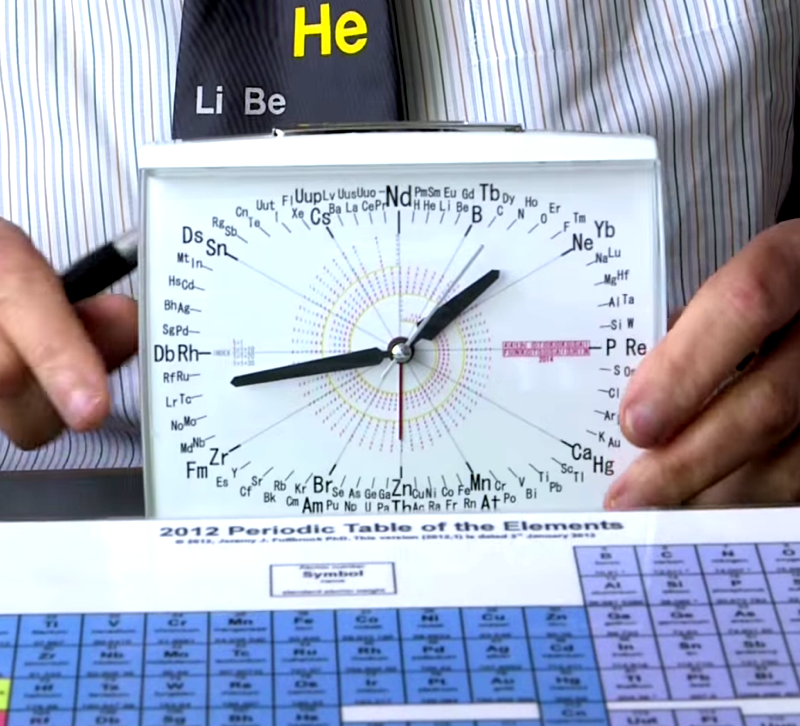 I based the order on the typical metallic characteristics: low ionization energy, electron affinity, etc... "
In 2014 Prof. Martyn Poliakoff – of YouTube fame – showed us a working Periodic Table clock, here. 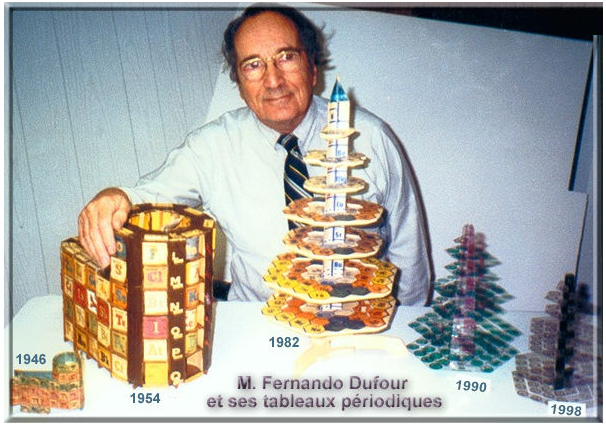 The first periodic table was developed in 1862 by a French geologist called Alexandre-Émile Béguyer de Chancourtois. 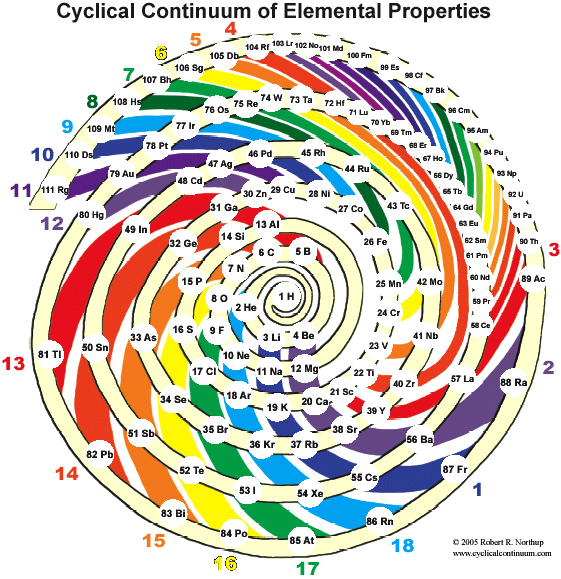 He plotted the elements on a cylinder with a circumference of 16 units, and noted the resulting helix placed elements with similar properties in line with each other. 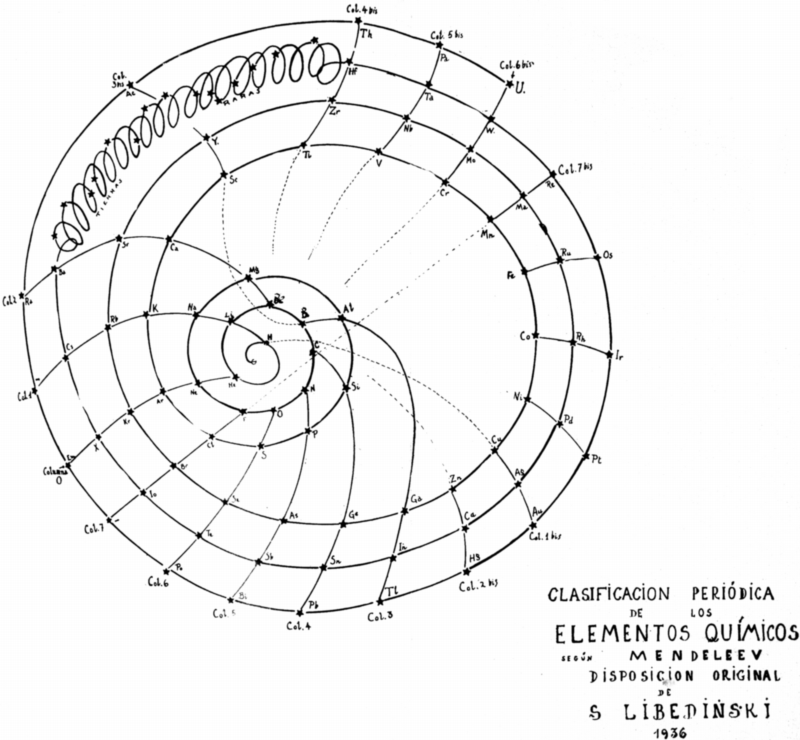 But his idea - which he called the "Telluric Spiral" (see here), because the element tellurium was near the middle - never caught on, perhaps because it was published in a geology journal unread by chemists, and because de Chancourtois failed to include the diagram and described the helix as a square circle triangle. 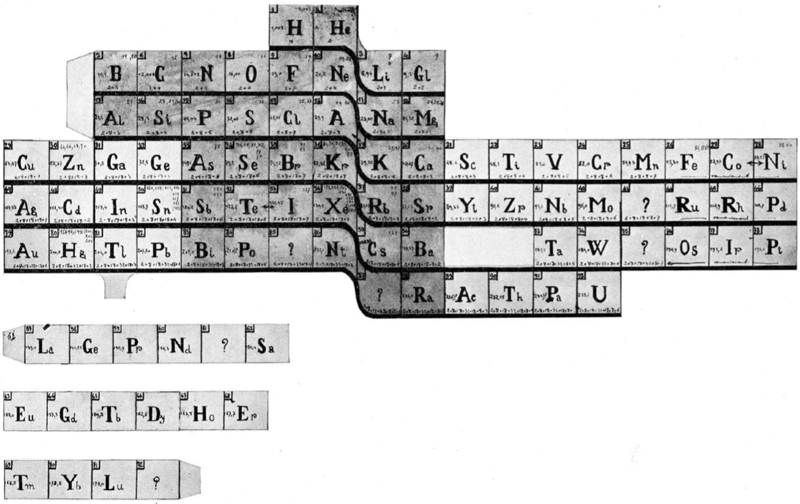 Mendeleev got all the glory, and it is his 1869 version (dramatically updated, but still recognizable) that nearly everyone uses today. This instructable [project] documents my efforts to reimagine a 3D periodic table of the elements, using modern making methods. 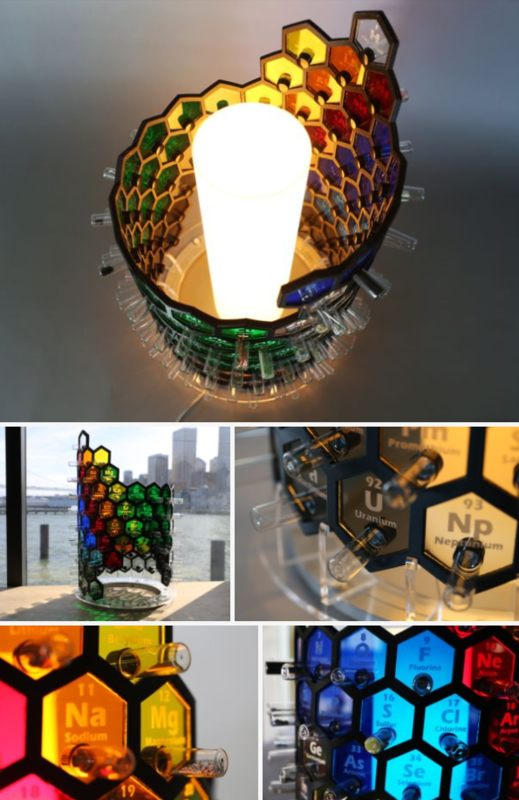 It's based on the structure of a chiral nanotube, and is made from a 3D printed lattice, laser cut acrylic, a lazy susan bearing, 118 sample vials and a cylindrical lamp. 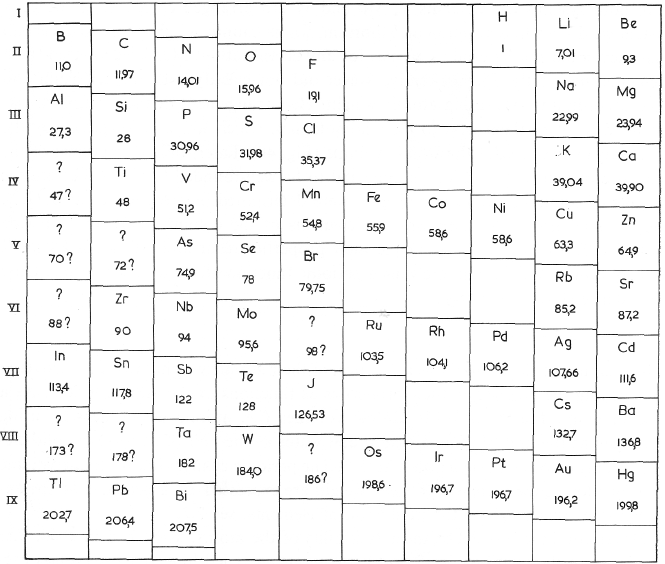 Mikhail Kurushkin has a way of constructing the standard long form periodic table from the Janet Left-Step formulation. 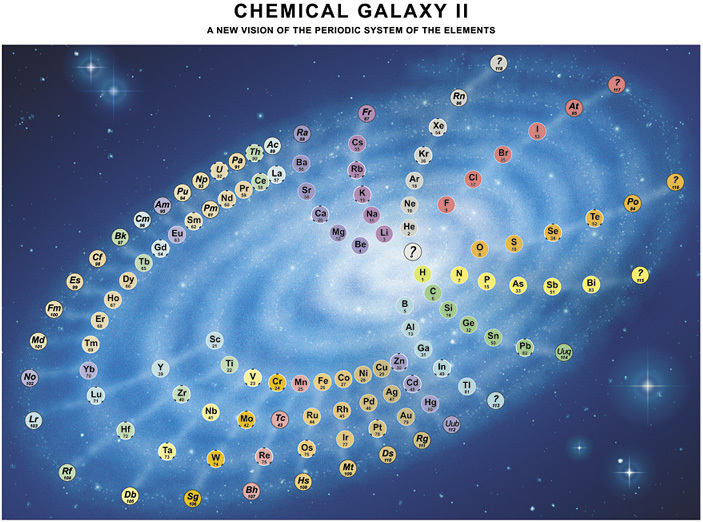 Updated from Philip Stewart's Chemical Galaxy II, version III shows all the recently discovered elements, including: 117 (Ts) and 118 (Og). 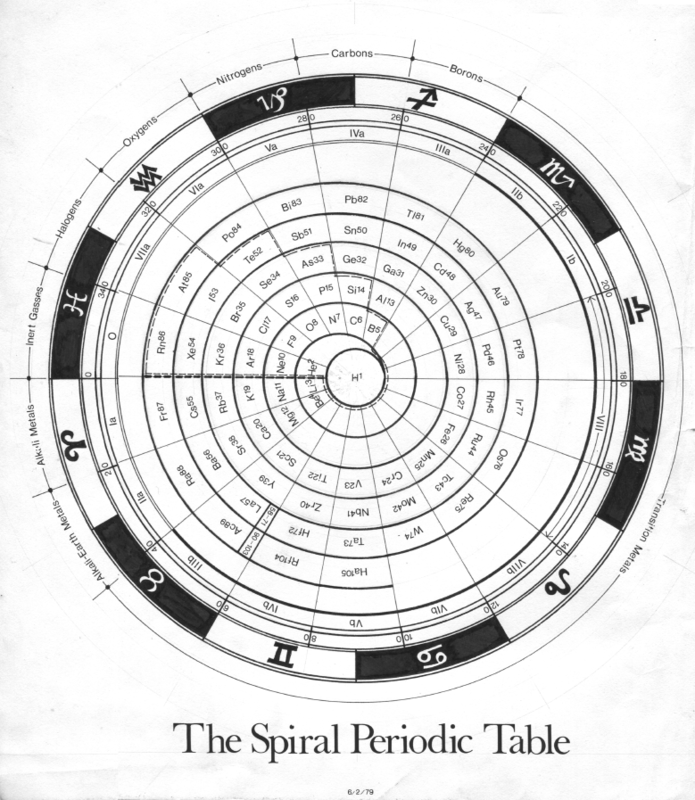 A spiral periodic table formulation by Nawa, called the Nawa–Scerri Octagonal Periodic System. 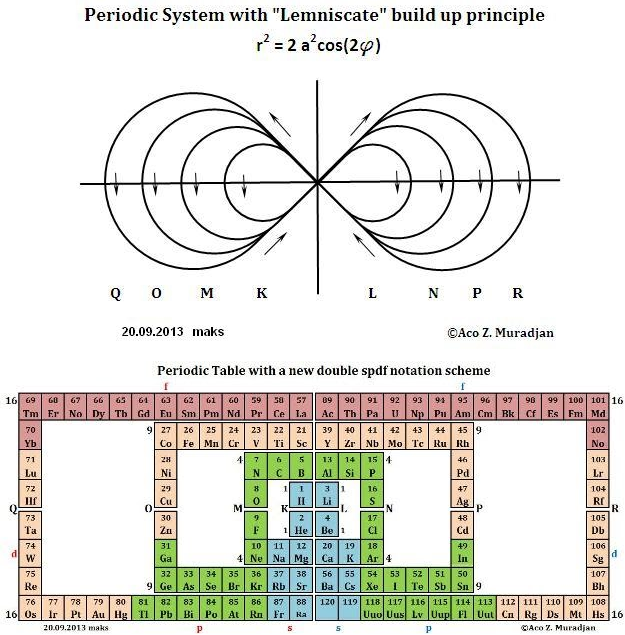 "My father, Manouchehr Ziaei, has an interesting design of the periodic table, which I helped him draw using AutoCAD. 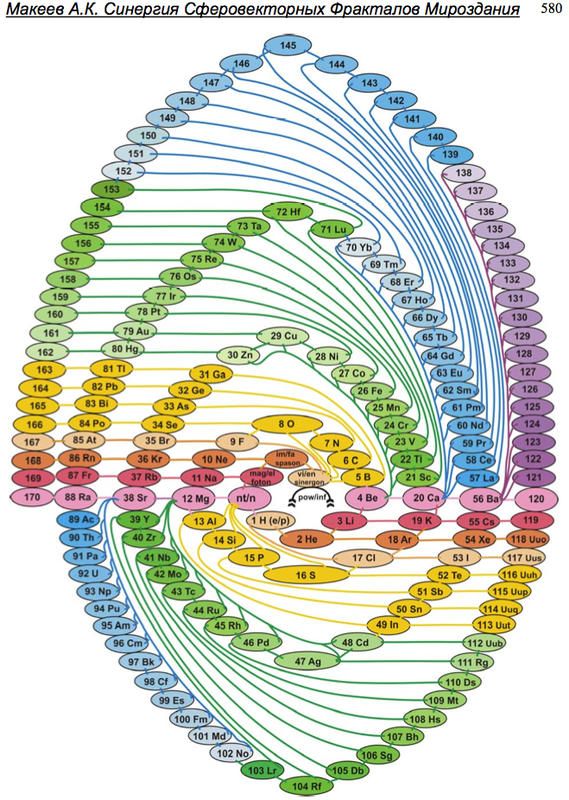 He is very keen in introducing [this formulation] to potential interested viewers, he was recommended to visit [the Chemogenesis Database of Periodic Tables] website." 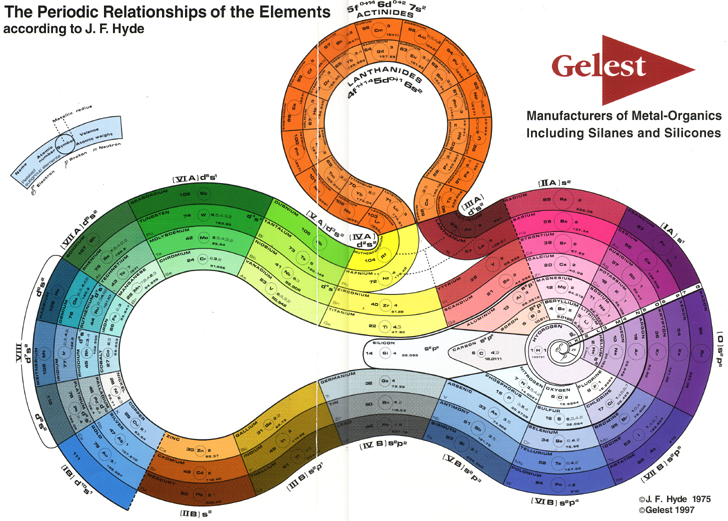 The Telluric Helix (La Vis Tellurique) was the first graphic representation of the periodic system of the elements, conceived as a spiral wound round a cylinder. 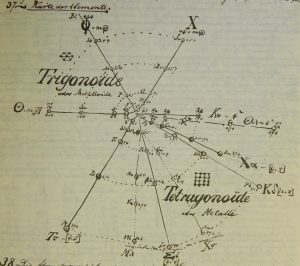 It was designed in 1862 by Alexandre-Émile Béguyer de Chancourtois, a French mineralogist. 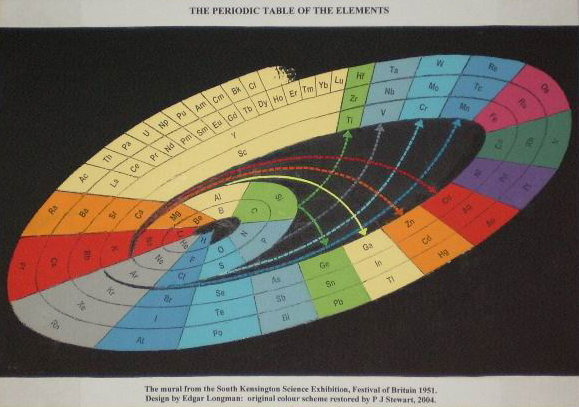 'Telluric' is from Latin tellus, earth, recalling the 'earths', oxides, in which many elements had been discovered. 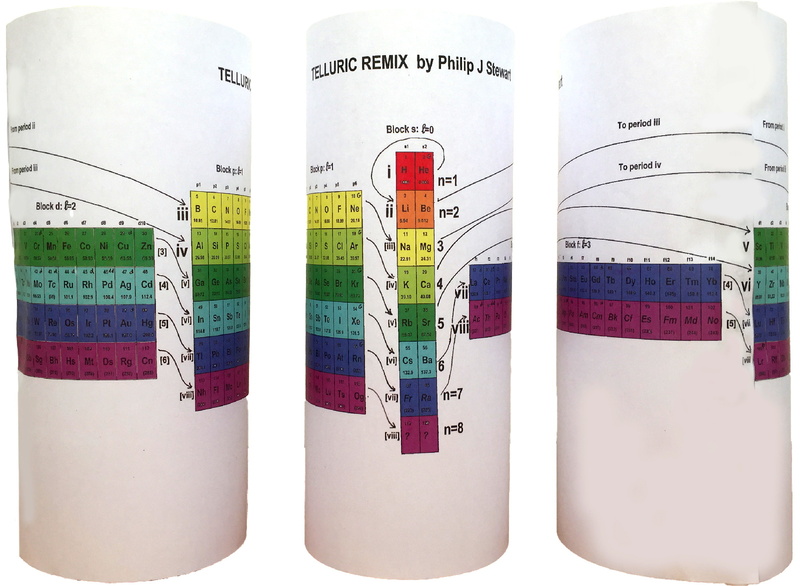 My 'Telluric Remix' is a return to the cylinder. 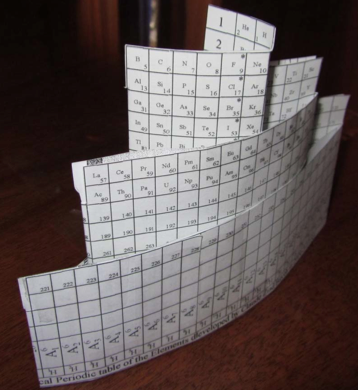 It combines ideas from Charles Janet (8, not 7, periods, ending with ns2, defined by a constant sum of the first two quantum numbers, n and l), Edward Mazurs (all members of each electron shell in the same row) and Valery Tsimmerman, (a half square per element). 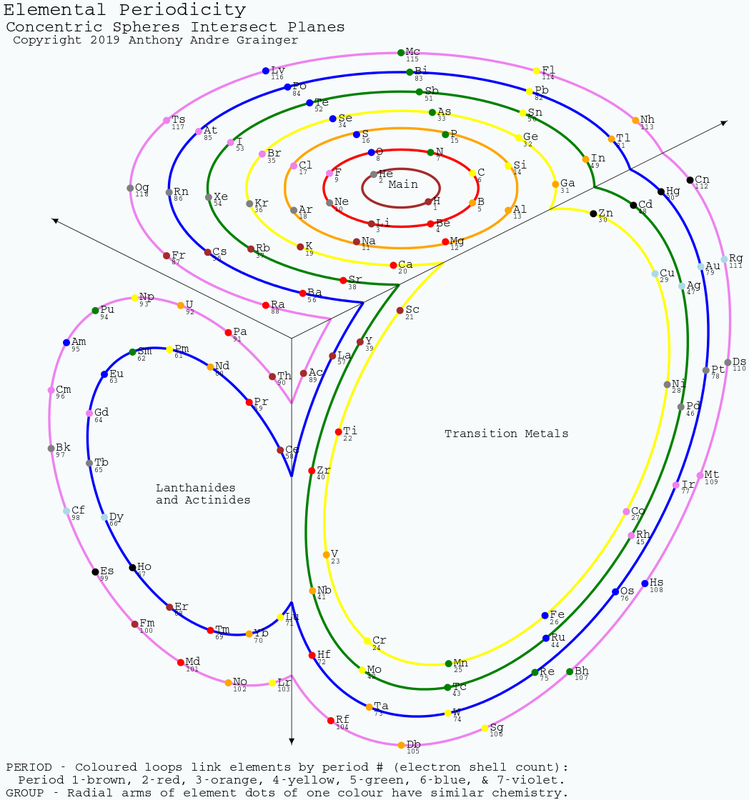 The Telluric Remix is topologically the same as my 'Janet Rajeuni' and 'Chemosphere': it maintains the continuous sequence of atomic numbers with the help of arrows, which cascade down, displaying graphically the Janet [Madelung] rule for the order of subshell filling. 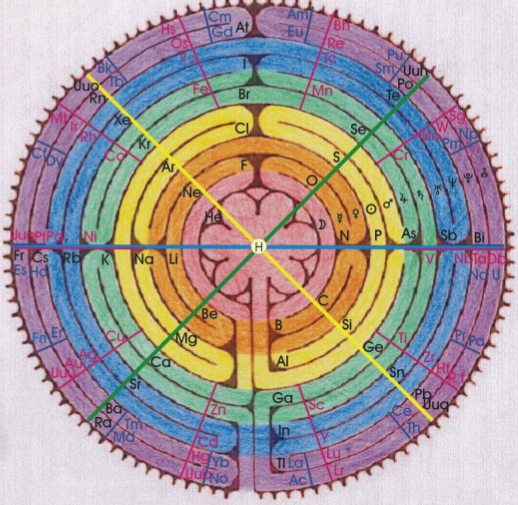 I have placed the s block in the centre to emphasise its pivotal nature and so that there is no question of whether it belongs on the left or on the right. 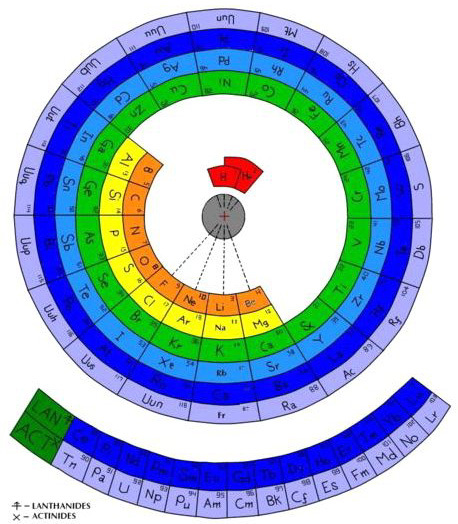 Every shell (Arabic numeral) and every period (Roman numeral) ends with ns2, but the ns electrons combine with f, d or p electrons of elements in the succeeding period to make their valence shells, until ns2+np6, which forms a noble gas. 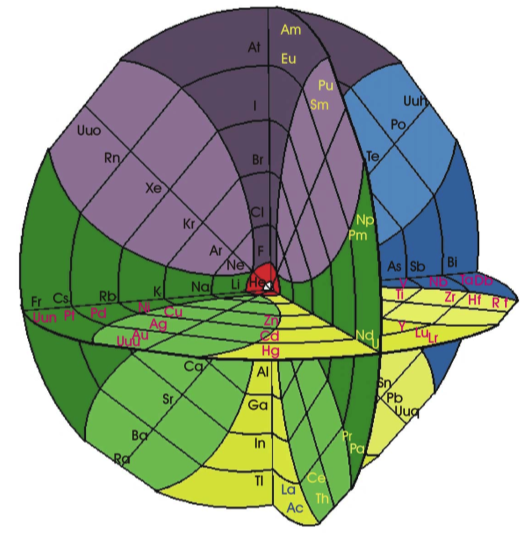 Helium, He, is also noble with a complete n=1 shell and no 1p6. 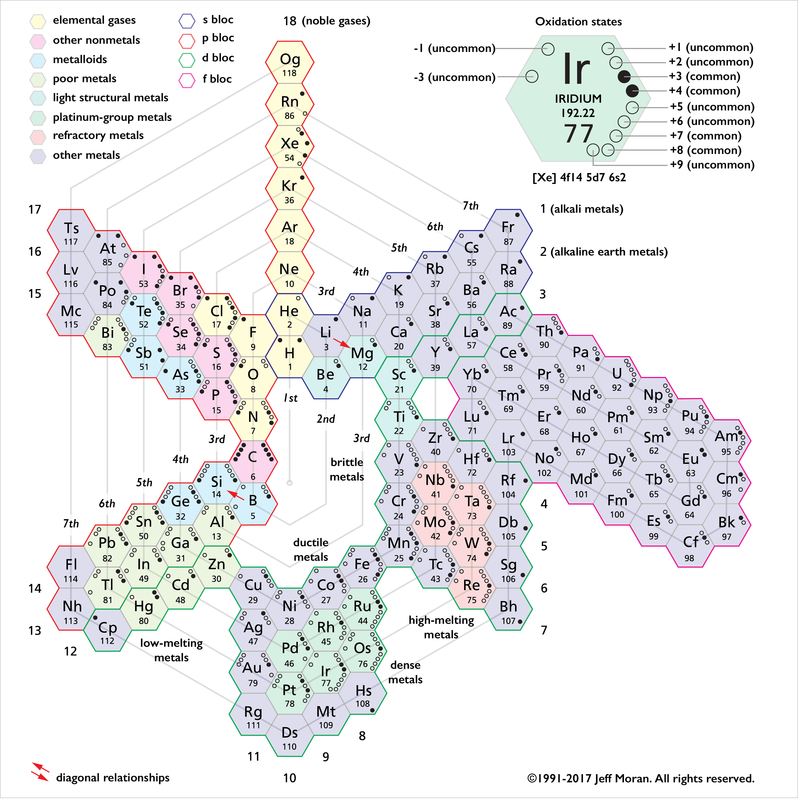 Noble gases are marked G. Groups are numbered sequentially within each block, and in general the xth member of the series has x electrons in the subshell. 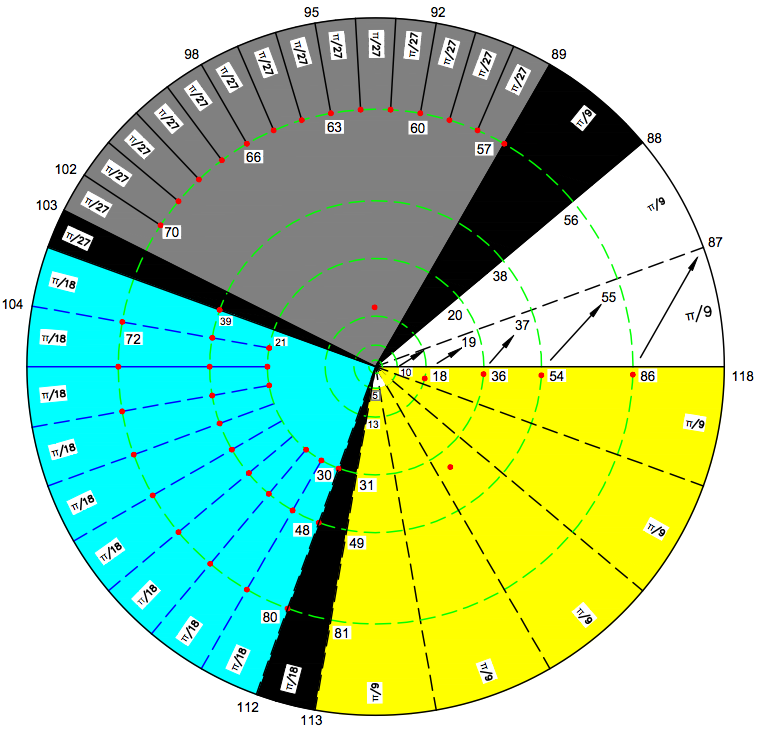 Exceptions are shown by a small d (or two) in the corner, signifying that a d electron replaces an s electron in the d block or an f electron in the f block (note also p in Lr). This makes it easy to determine the electronic structure of each element. 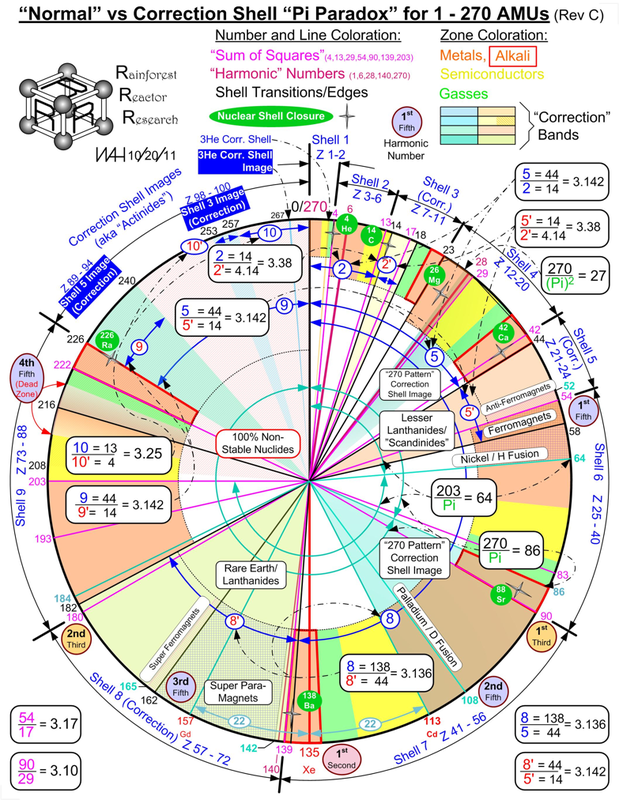 Click here for a larger version (pdf). 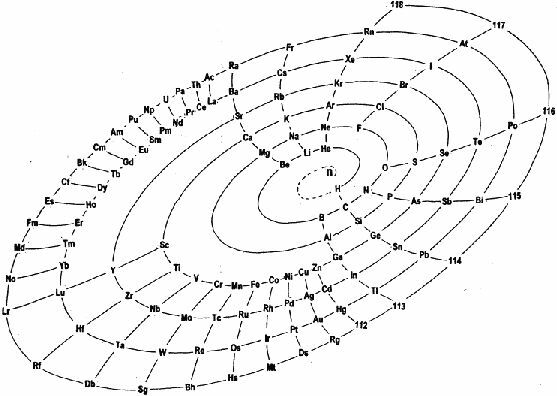 From Tony Grainger, an Elemental Periodicity formulation with concentric spheres intersecting orthogonal planes. 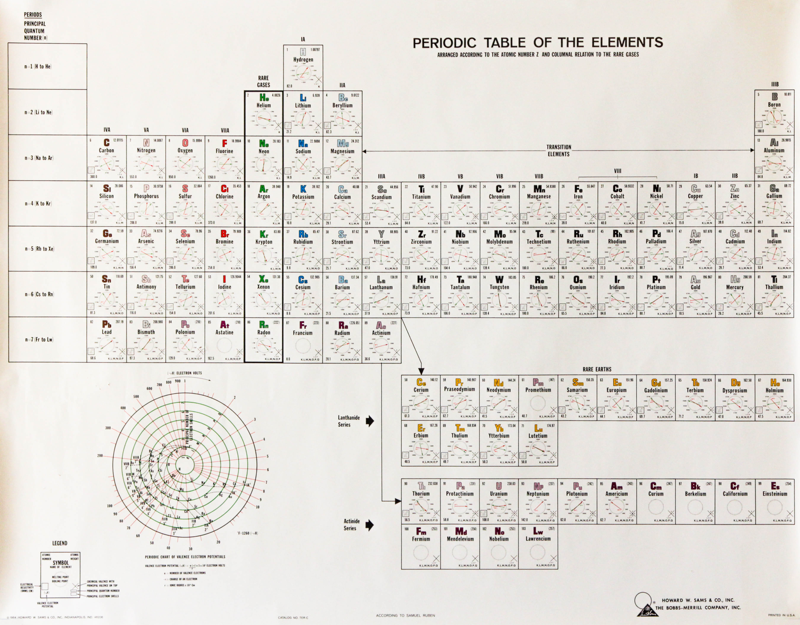 "I hand sketched this periodic table about a decade ago and placed it on my cubicle window at UTAS, with minimal comments from work mates. It bears some similarity to other formulations in the database, especially when cut along the left axis and laid flat. 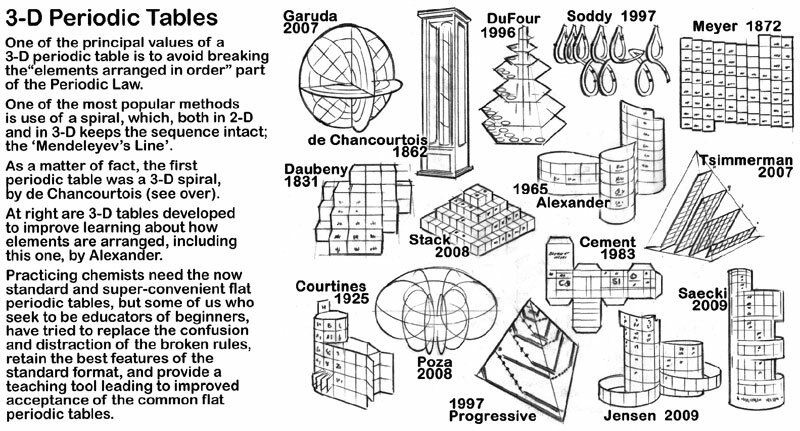 The concept of all elements of a period being aligned along orthogonal planes cutting a sphere was inherent in the original sketch. 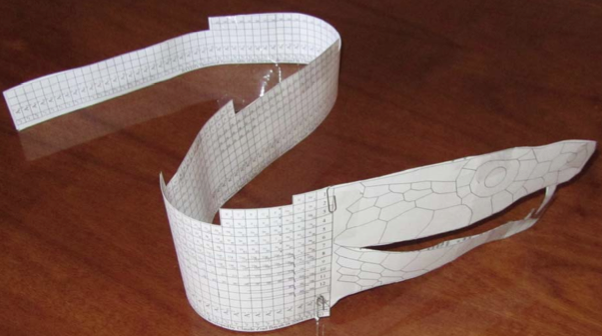 When I began using SVG about five years ago I realised I could draw this as a real projection of the 3D model. It was on the back burner, until I found the original sketch during a tidy up." 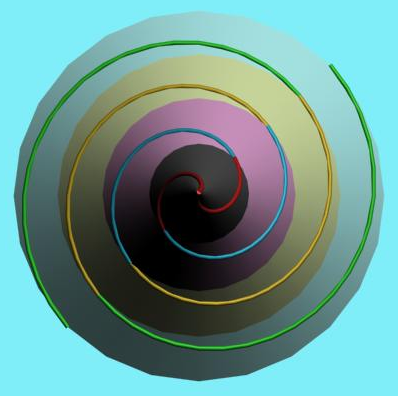 There are two images of this 3D formulation: an "inside_corner_below/outside_corner_above" (top image) and an "outside_corner_below/inside_corner_above" lower image. 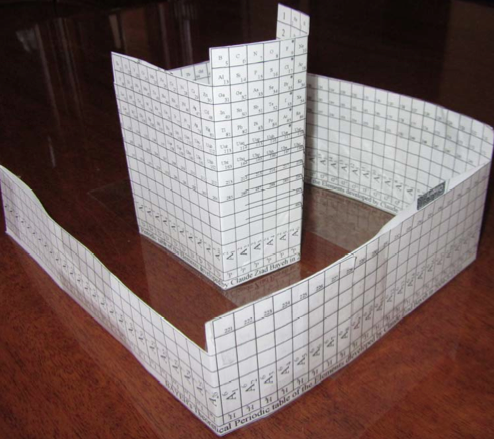 The "inside corner below" is like looking at the junction of a floor and two walls in the corner of a room. The "outside corner above" is like looking up at the underside of an overhanging corner of a building. The "outside corner below" is like looking down on the corner of a large box. The "inside corner above" is like looking at the junction of walls and a ceiling in a room.